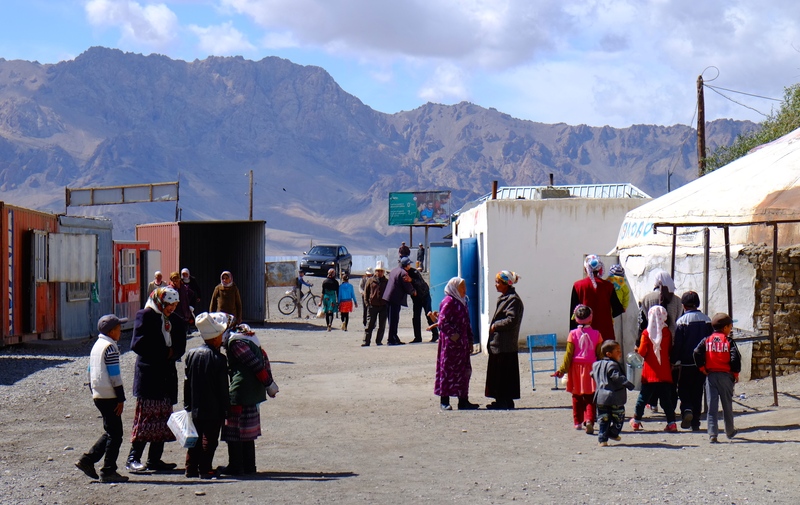 Poorest country in Central Asia: a teacher earns approximately 80 USD per month and it is estimated that 20% of the population lives on less than 1.25 USD per day. 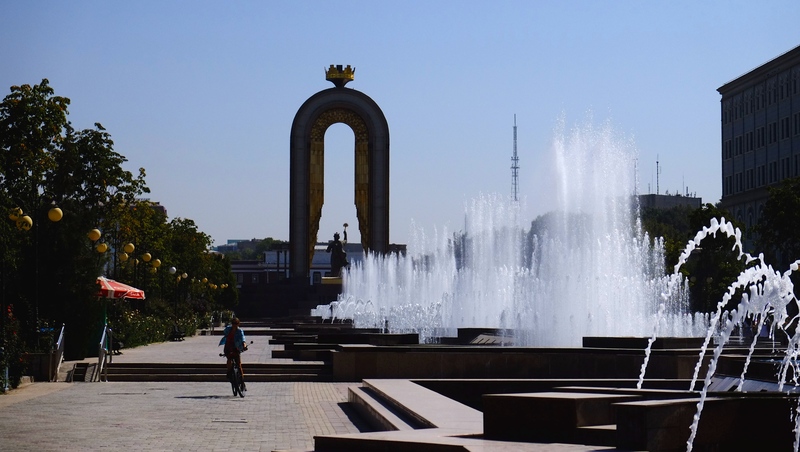 9 – 20 September 2015 – We’ve had a wonderful time in Dushanbe. Only then we realized how tired we were. Not only from a 24-hour drive heart-stoppingly close to cliffs but also from the hard work over the past few weeks. 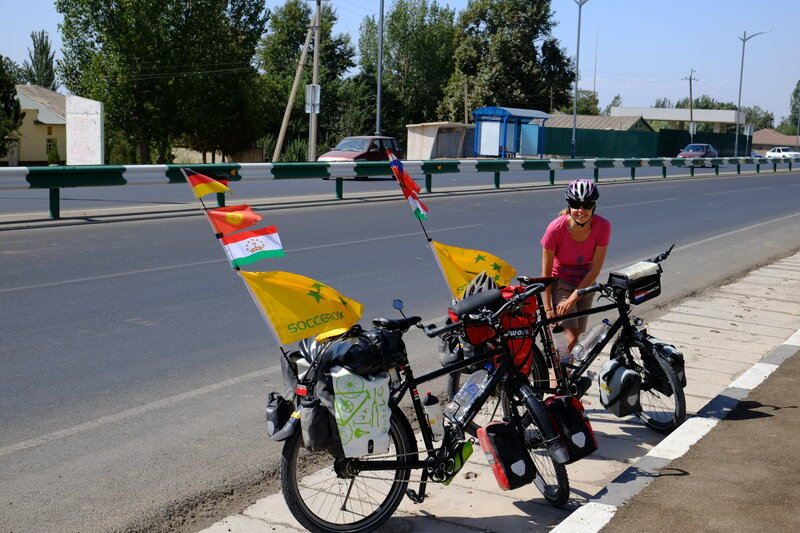 The coming days we did not set an alarm, we did not struggle against headwinds and instead just slept, read, ate, updated the blog, slept, strolled through the city, relaxed a bit more, applied for our Turkmen transit visas, slept again, met a few other cyclists and enjoyed the luxury of our guesthouse. 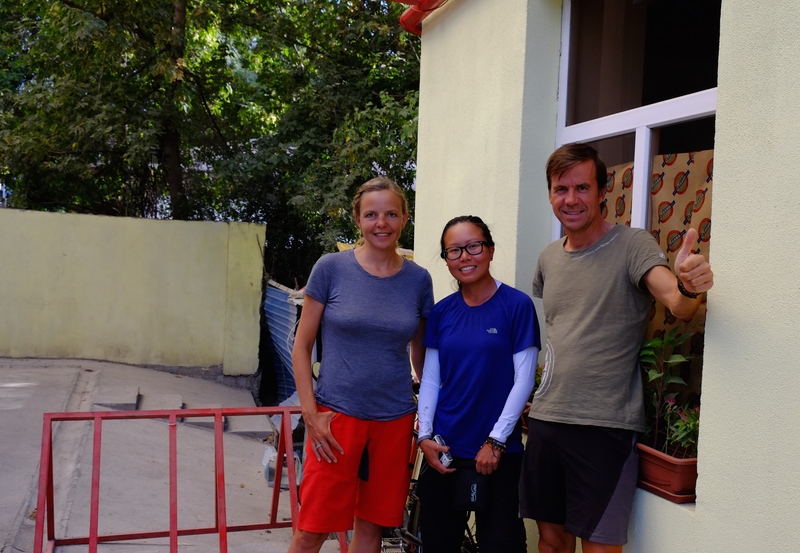 Finally meeting Phoebe who is cycling to Singapore. We met her brother a few years ago in Singapore and have been following Phoebe’s travels since earlier this year. 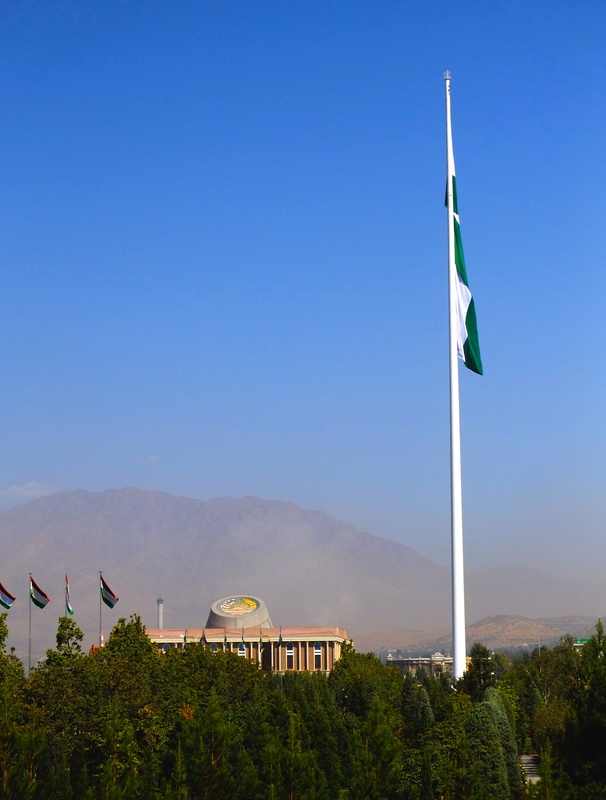 Once Asia’s largest flagpole, the flag alone measures 2000 square meters! The day our visas should have been ready we nervously cycled to the embassy. We had heard too many stories of people getting rejected for no obvious reasons. We arrived at around 9am only to hear that they would only open by 9.30am. Finally inside we were told to come back the next day, the visas weren’t ready as yet. 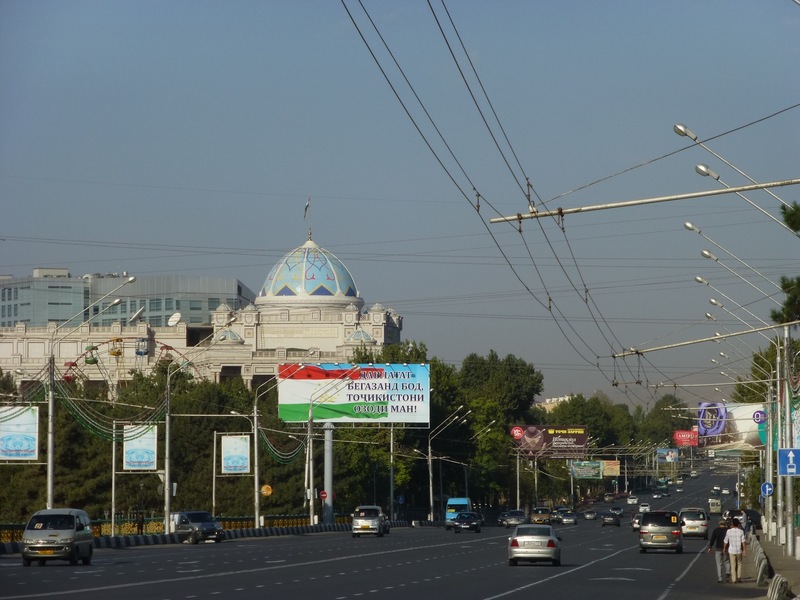 Now we were even more thankful that we had arrived on time in Dushanbe as the next day was Friday and Sunday was the day we had to leave Tajikistan. If we wouldn’t get the visas on Friday we would have to leave without. 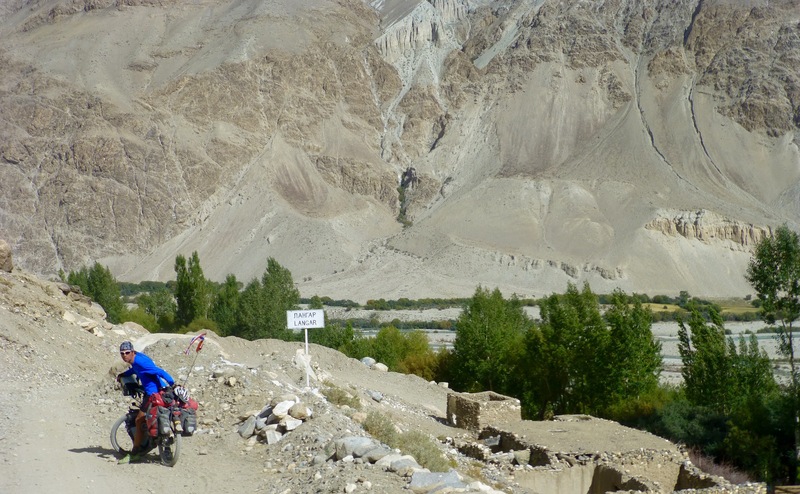 But lucky as we are the next day it was ready – we only had to cycle across the city through mad traffic to pay our 110 $ visa fee to a Pakistan Bank located at the other end of the city and pedal once more all the way back. Finally we were ready to hit the road again. The next morning the alarm went off early again but we couldn’t believe our eyes. It was raining! We haven’t seen any rain in weeks. The forecast was bad for the whole day and eventually we stayed another day. 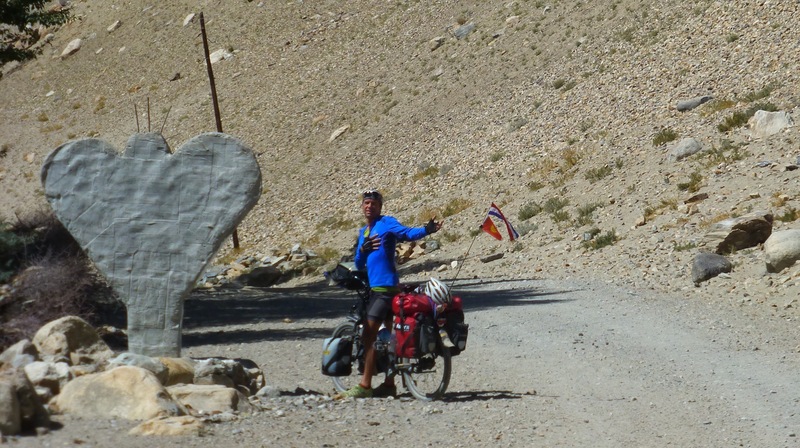 Good decision, the following day we set off on a clear and sunny day with slight tailwinds. 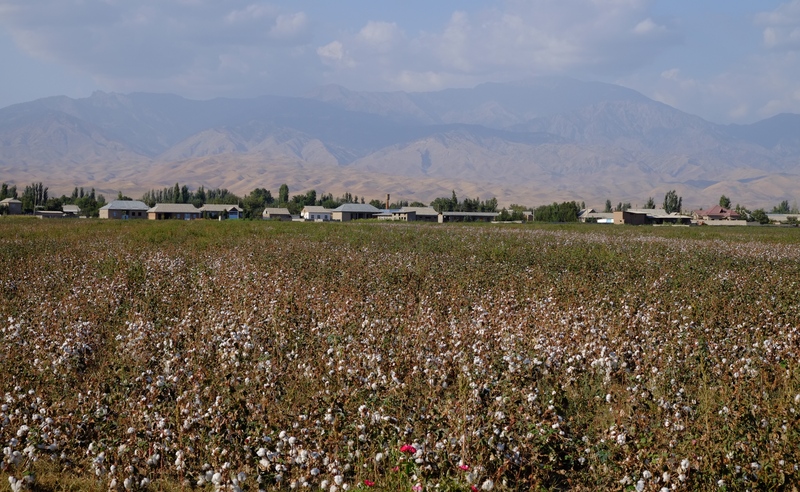 Mostly we cycled along boring cotton fields, apple plantations and grapevines, with a barren mountain chain in the background. 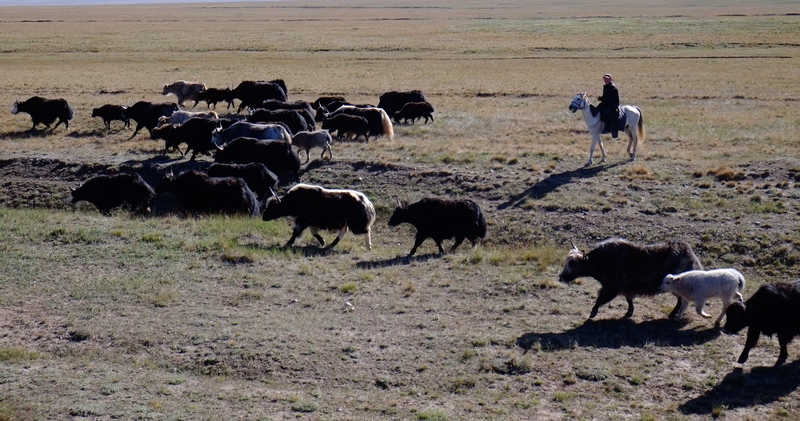 But after 12 days off the bikes we enjoyed sitting once again on our hard saddles. Halfway to the border we got a water melon and ate it together with the friendly and very well English-speaking people. Later that day I got fresh grapes and Johan a freshly baked bread. 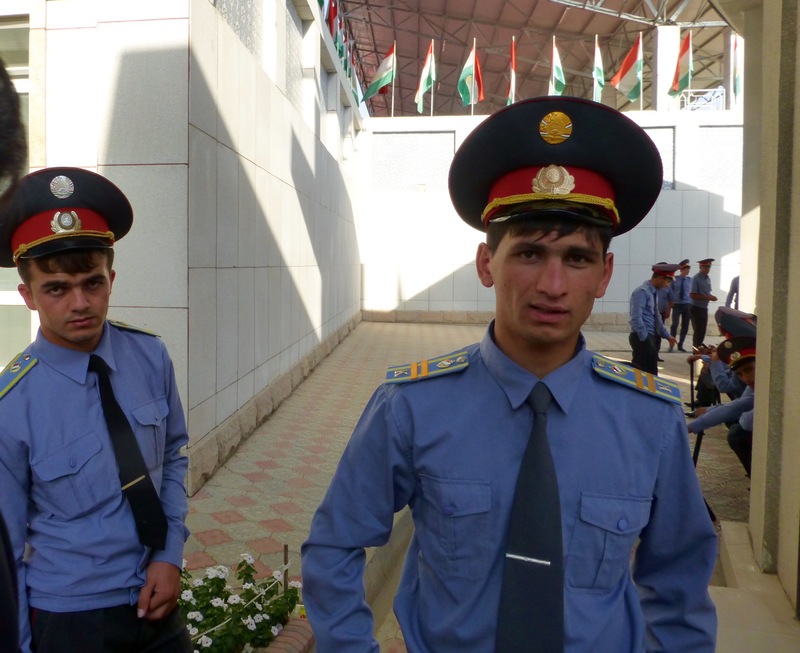 From everywhere we once more heard friendly ‘Hellos’ and ‘Salams’ and people kept asking us how we liked Tajikistan. 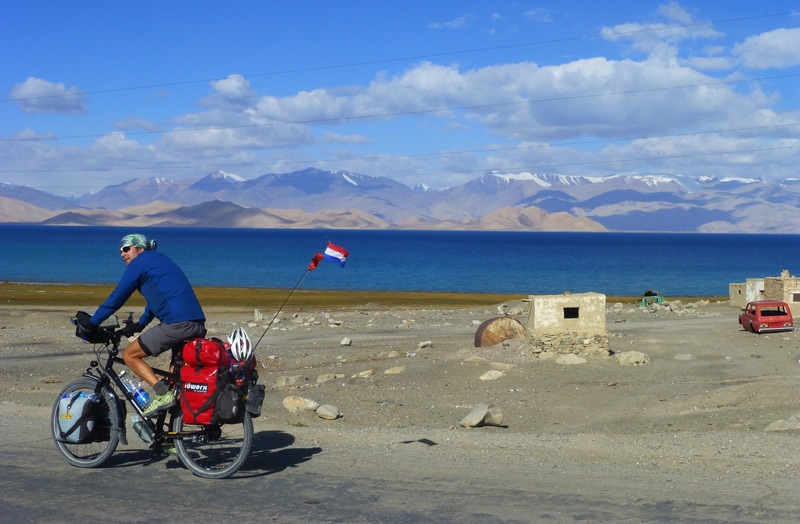 We were no longer ‘normal’ tourists but cycling travellers attracting a lot of attention and causing much confusion. 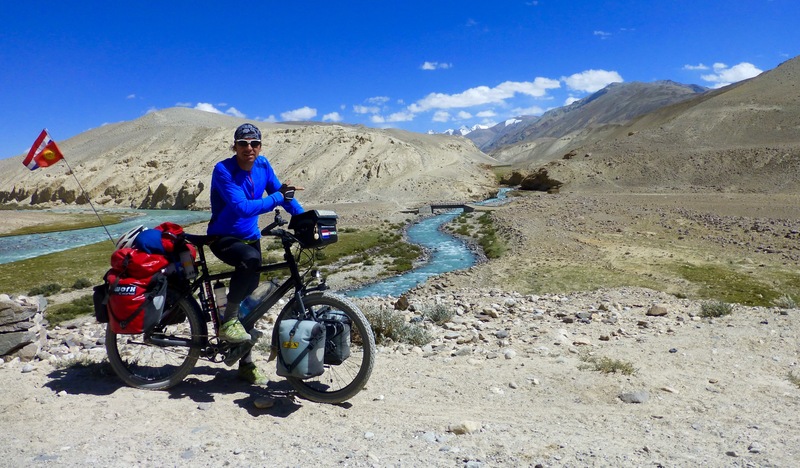 ‘Why do you cycle? Why not go by car? This is so much easier!’, were the questions and comments we got from locals. 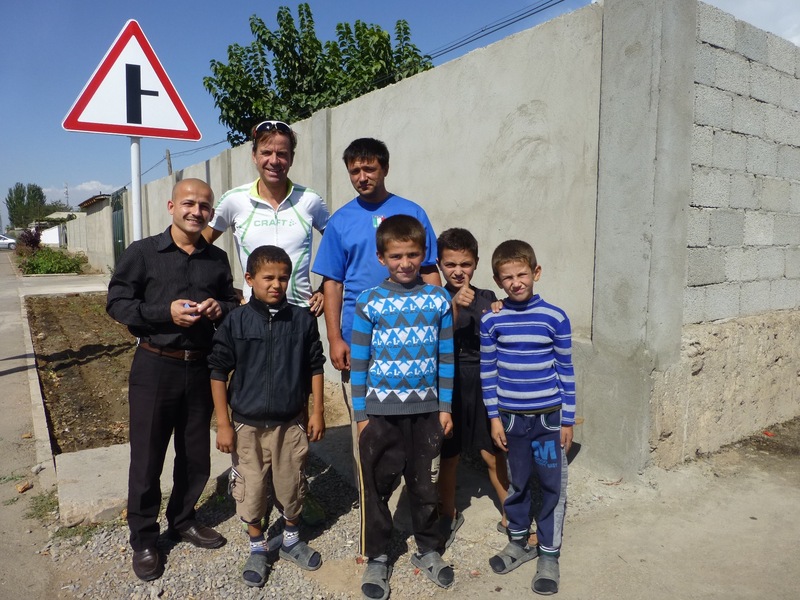 Only the poorest or kids are cycling in Tajikistan, everyone else rides a car. 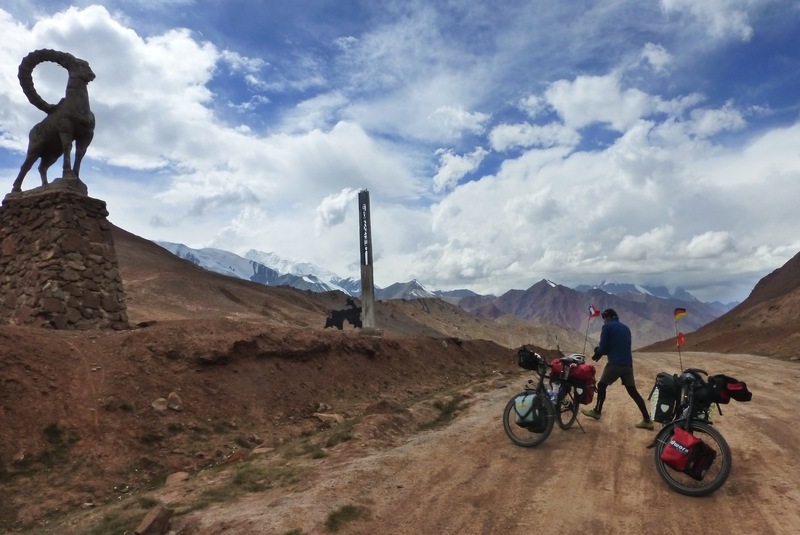 We entered the country from a very poor area and cycled through one of the most remote regions. 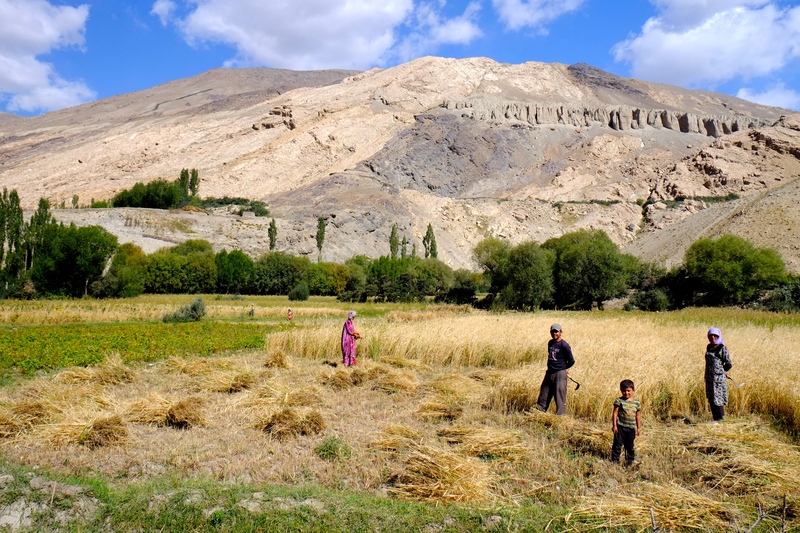 The climate is rough with hot and arid summers and very cold winters. 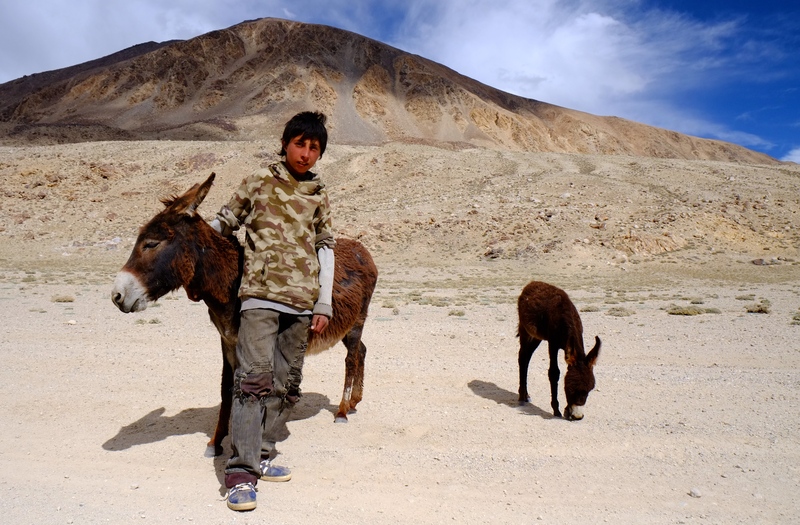 People are shy but very friendly and hospitable. Food is basic with little variety. Soup is the staple dish and if we were lucky there were a few other vegetables than potatoes in it. With it we usually got stale bread and sweets. Sometimes fried potatoes or plov (fried rice with carrots and mutton meat) was served. If we were very lucky we got tomato and cucumber salad, most likely the cause for our constant stomach issues. Bathrooms are basic and usually quite dirty. This surprised us as they are very tidy if it comes to their houses. You must not enter the house with shoes, that’s a major offence. Early in the morning they start sweeping the floors and it continues throughout the day, often to our annoyance as they cause more dust than anything else. Squat toilets are built as far away from the house as possible and shower facilities usually don’t work – there was either boiling hot or ice-cold water, nothing in between. Sometimes there would only be a few drops coming out of the tap. But then these were bathrooms built for tourists. 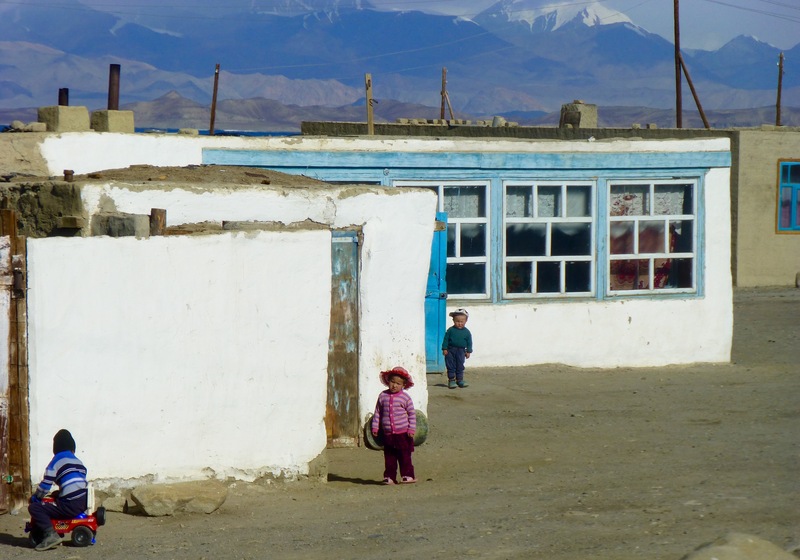 Locals on the countryside only have toilets, washing takes place in front of their houses with water out of a tin pot or a bucket. 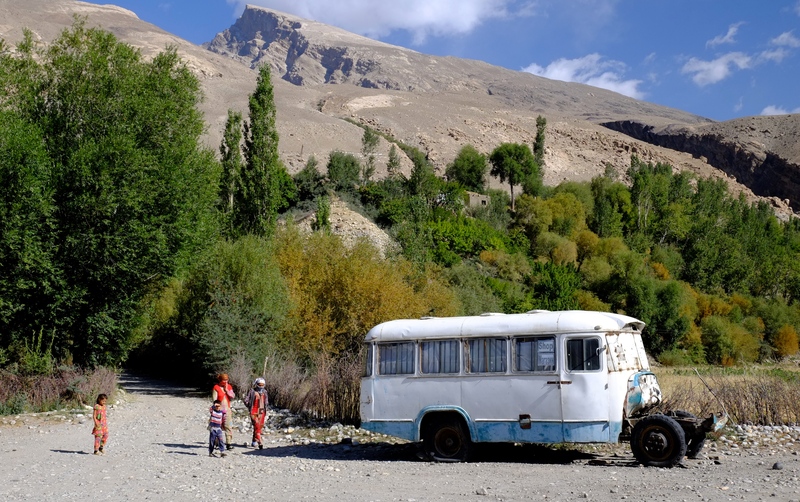 Tajiks are very bad drivers, same as everywhere else in Central Asia. 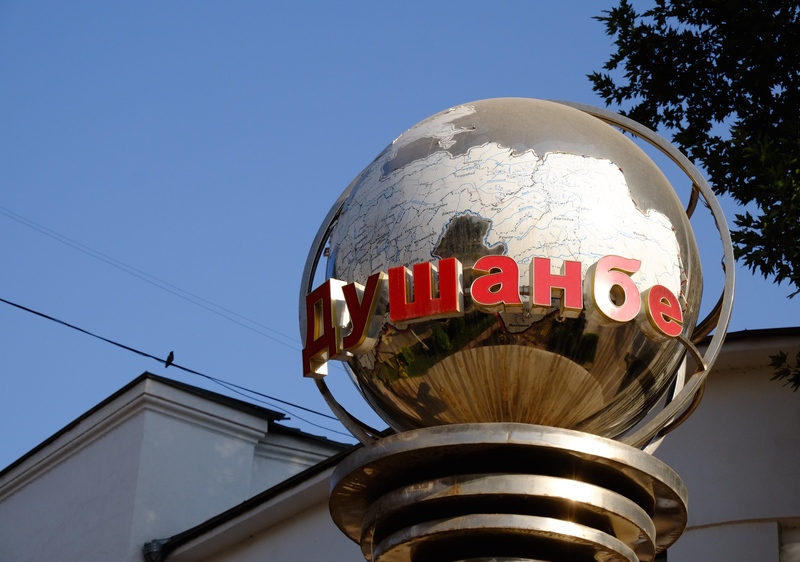 Due to the condition of the roads, cars – the majority being old ladas from the Sovjet era – are in the same poor state. 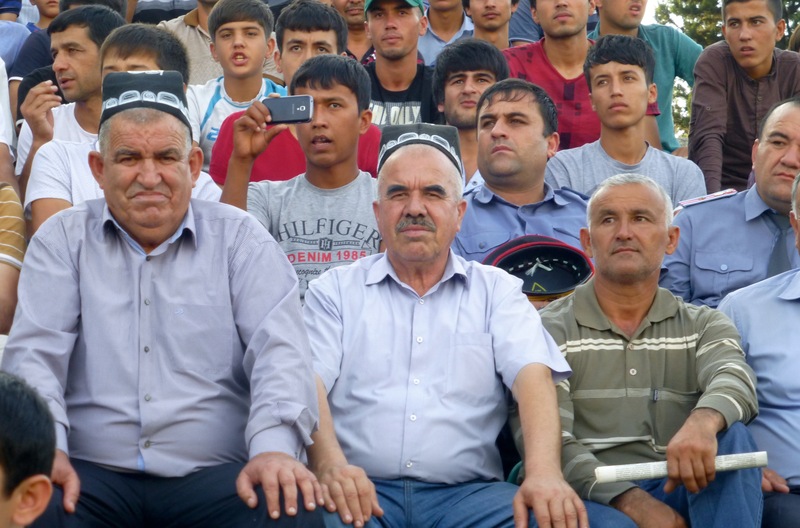 Tajiks only know one speed: fast. Wheels spin whenever they leave, they are overtaking everywhere whether they see something or not, they are always on the phone and we’ve hardly seen cars without broken windshields. Landscapes were absolutely stunning and breathtaking most of the time. 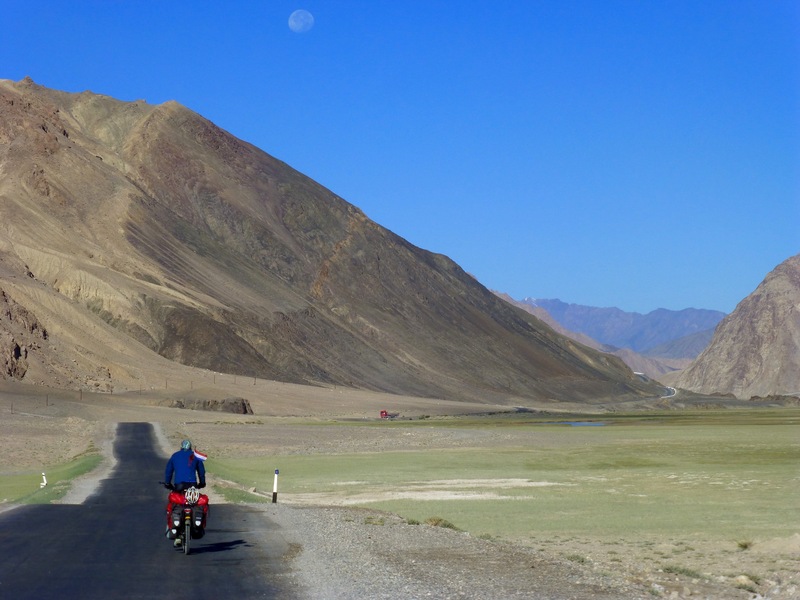 Being such a mountainous country it’s been the toughest cycling experience for us ever. 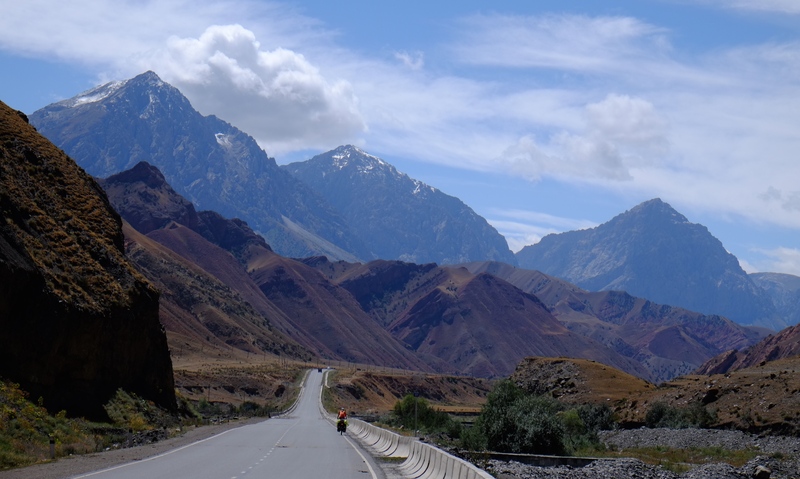 Despite all the pain and effort we’ve been through we are very grateful that we made it through the Pamirs in one piece and that we were able to explore these extraordinary landscapes. 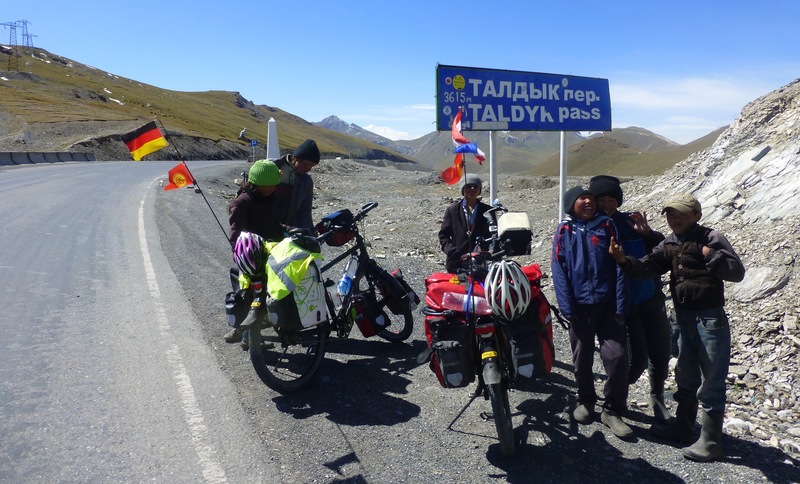 23 August – 8 September, 2015 – As the Pamir Highway has been an important milestone of our journey you’ll find below our diary entries with the highlights of every day presented in four parts. 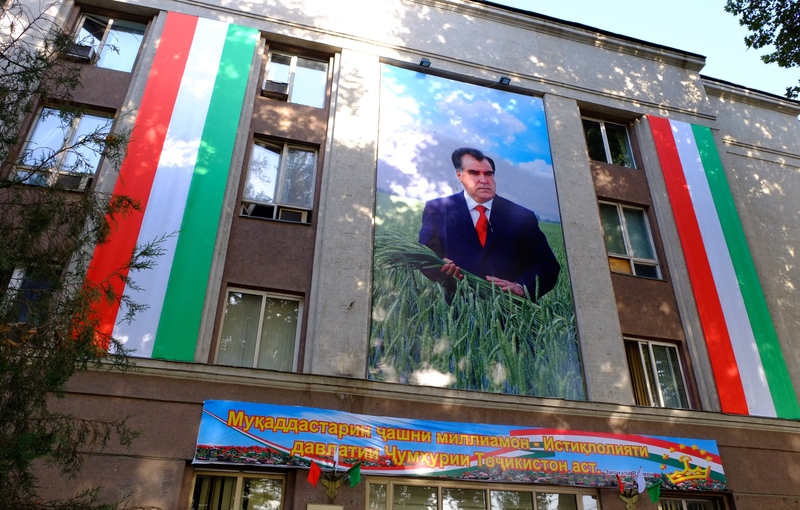 With Johan still being weak and us having to be in Dushanbe for our Turkmenistan visa application we take a taxi already from Ishkashim and not from Khorog as originally planned. 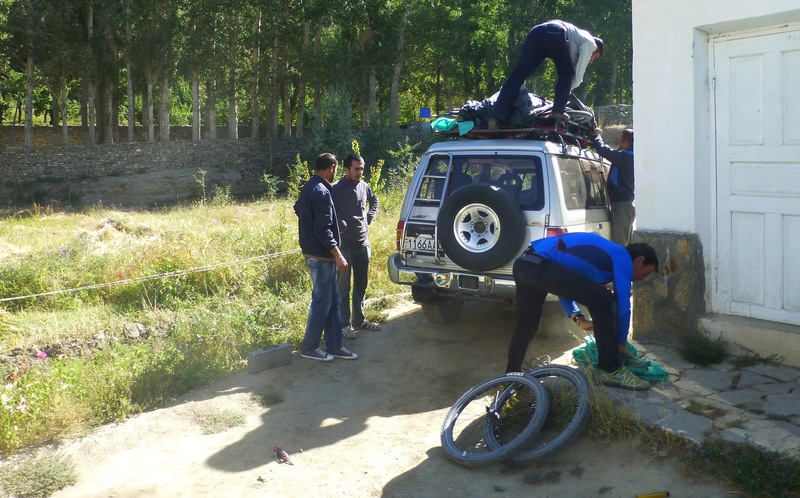 The guesthouse manager is able to negotiate a good deal with a taxi driver and we head off with our bikes on top of the car and the trunk stuffed with our many panniers. 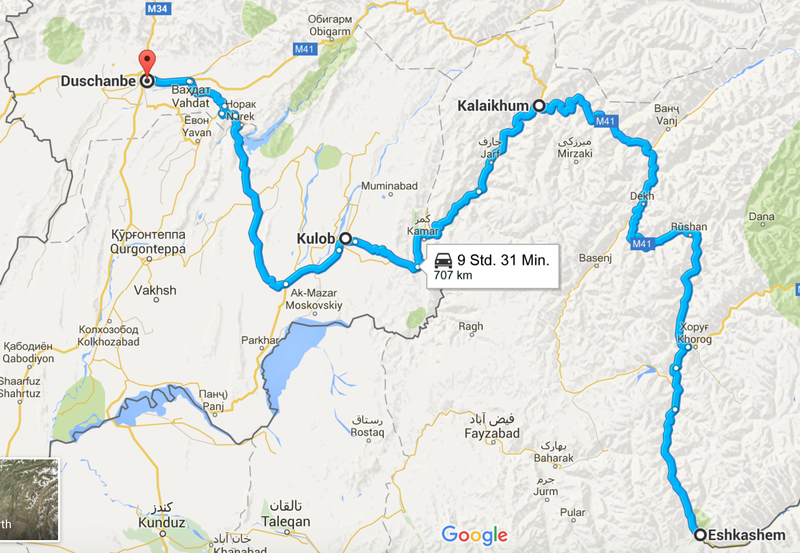 10 minutes later we pick up an Afghan police officer who also has to go Dushanbe – there it goes our private taxi. Annoyed and a few phone calls later we negotiate another discount as our private taxi has become a shared taxi. Unfortunately our macho driver thinks he owns the road and we think he might have obtained his driver’s licence in India as most of the time he is driving on the left handside. Much to our annoyance, as the left is the cliff with the river a few hundred meters below. 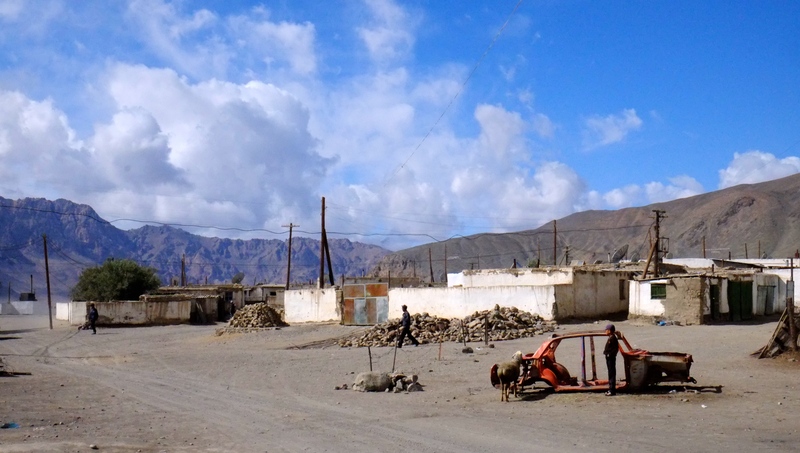 The bone-crunching road that has in the meantime rejoined the Pamir Highway continues twisting through canyons and gorges with barren mountains raising to the left and right. 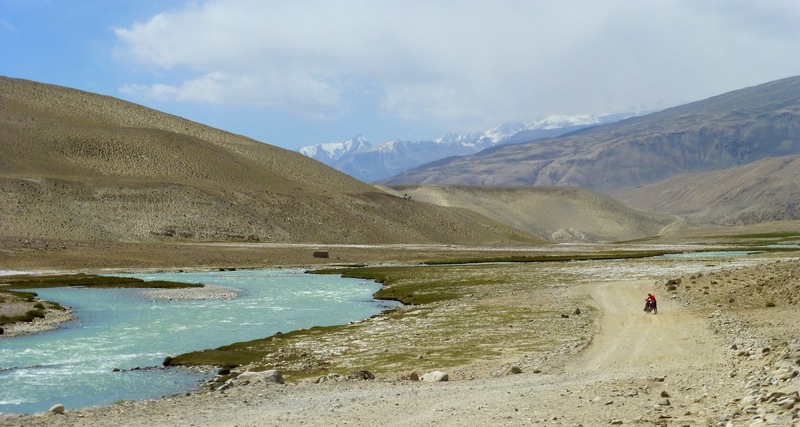 At the other side of the river still lies Afghanistan and a small donkey track winds along the river. 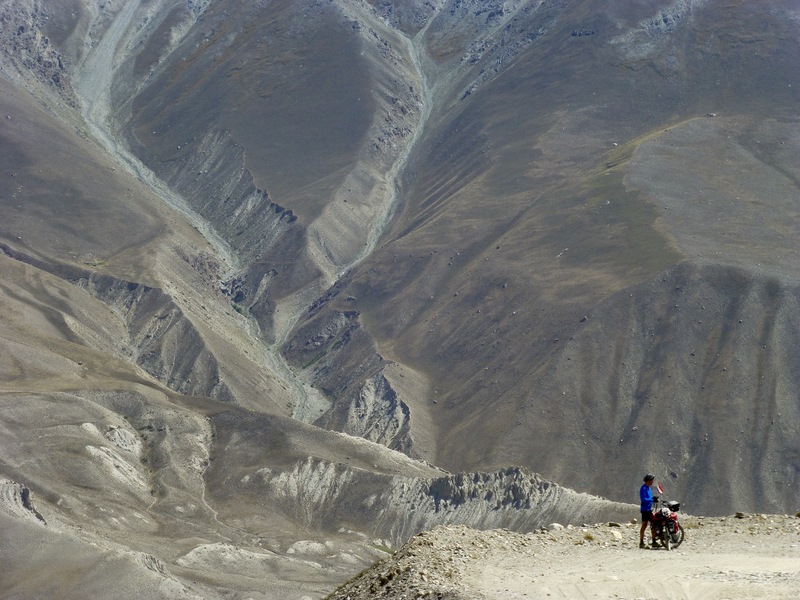 The vistas are spectacular and we both are saddened that we aren’t able to cycle this part of the Pamir Highway. 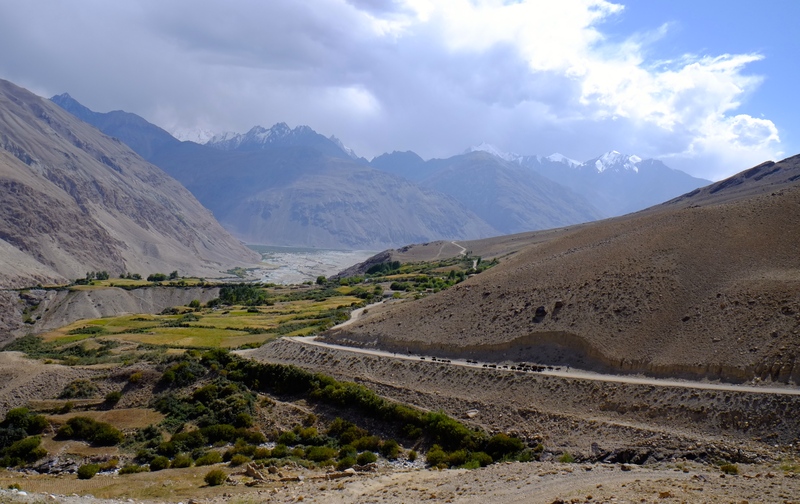 We also regret that we’ve relied on our travel guide’s advice to make a detour through the Wakhan Valley as we are now on the most spectacular part of the highway. Every once in a while Johan advises the driver to slow down, to drive on the right handside of the road and not to pass trucks on a one-way-track while we cannot see anything due to the dust raised by the vehicle in front of us. At nightfall we even get more scared as the road is worsening, the visibility is low and the driver seems to be more interested in the many phone calls that keep coming in until as late as 2am than paying attention to the road. Poor Johan stays awake all night, once avoiding a collision with a pile of sand and constantly arguing with the driver to make sure we’ll arrive safely. 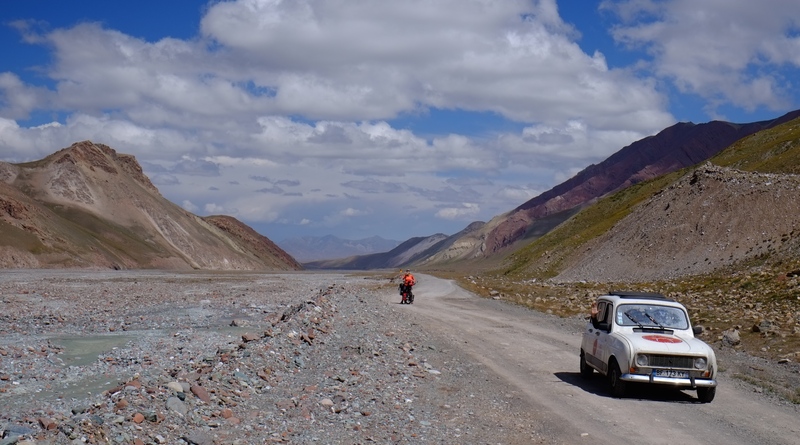 The next morning – on a finally paved highway – the driver once more needs to demonstrate his skills: at a horrendous speed of 140 km/h and a car that’s almost falling apart I tell him off and stubborn as he is he continues at 60 km/h asking every few seconds if he is still going too fast. 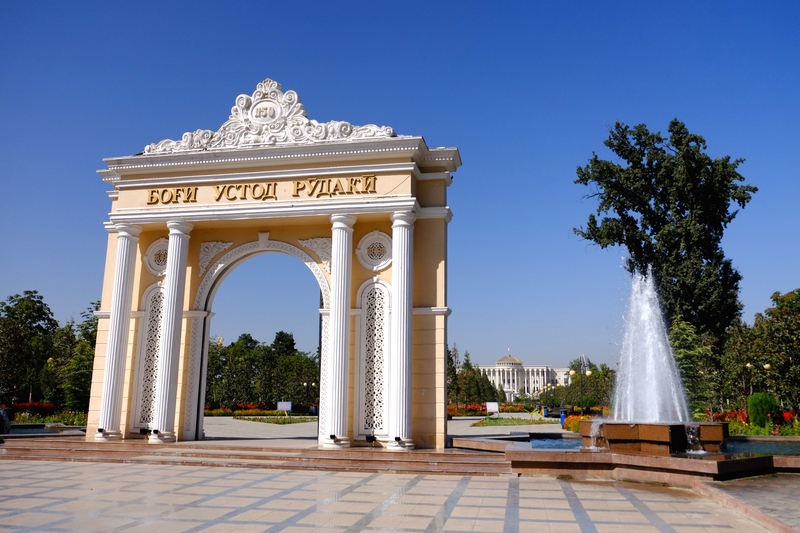 The atmosphere in the car climaxes when we arrive in Dushanbe and Johan tries to guide our driver to our chosen guesthouse, but he just doesn’t want to follow Johan’s instructions – while not even knowing where to go. Listening to the driver’s behavior in silence for a while and us standing at a crossing and the driver not wanting to turn left as needed I burst out and yell at him to do what Johan is telling him, adding some abusive language in German and we finally arrive after 24 sleepless hours. 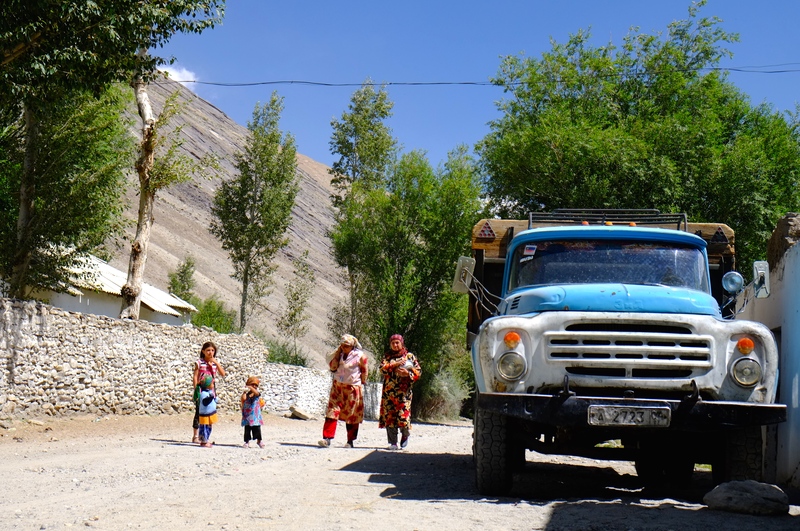 During this far too exciting journey we pass about 20 military and police check points, each time showing our passports and each time having long discussions because of the Afghan in a car with European tourists. 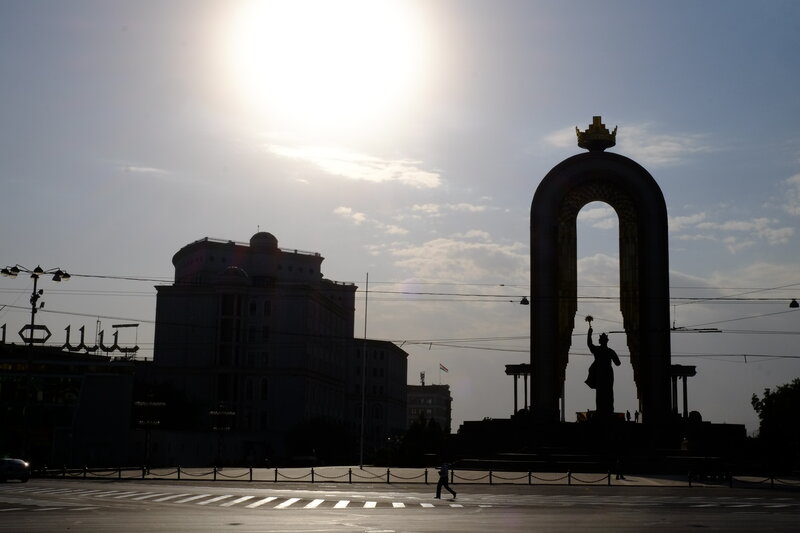 Later we learn that there had been a clash with several fatalities a few days ago in Dushanbe. 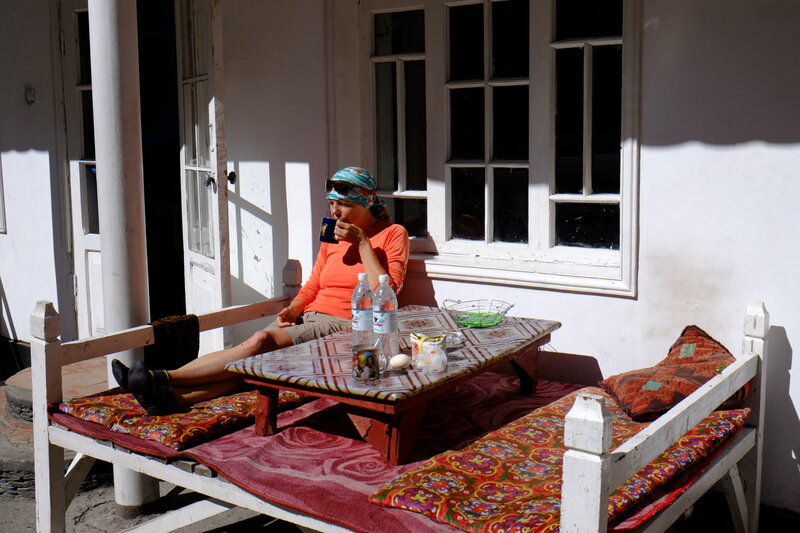 Johan negotiates a fantastic deal at Marian’s Guesthouse where we will relax until we have our visas for Turkmenistan. 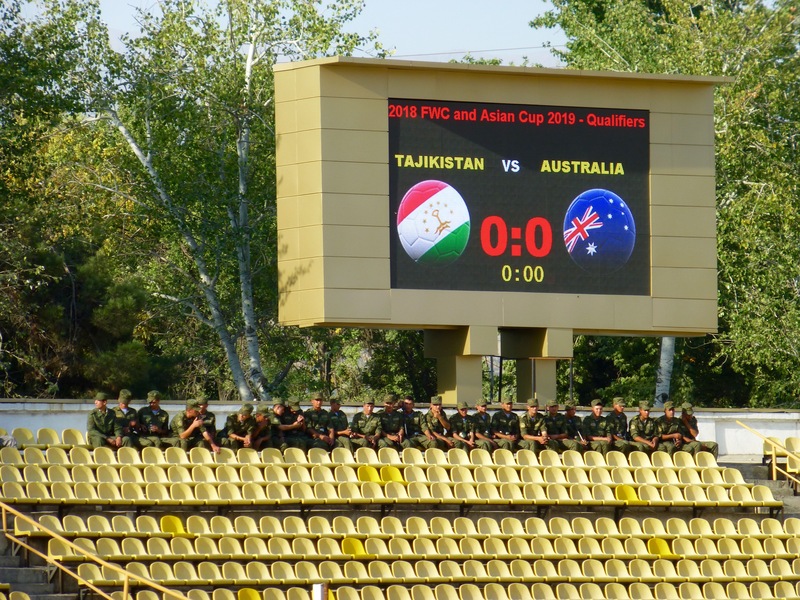 Today also happens to be the day the Australian football team plays against Tajikistan to qualify for the 2018 World Championship. Lucky as we are we chose to stay at an Australian-run guesthouse with a few Australian fans. 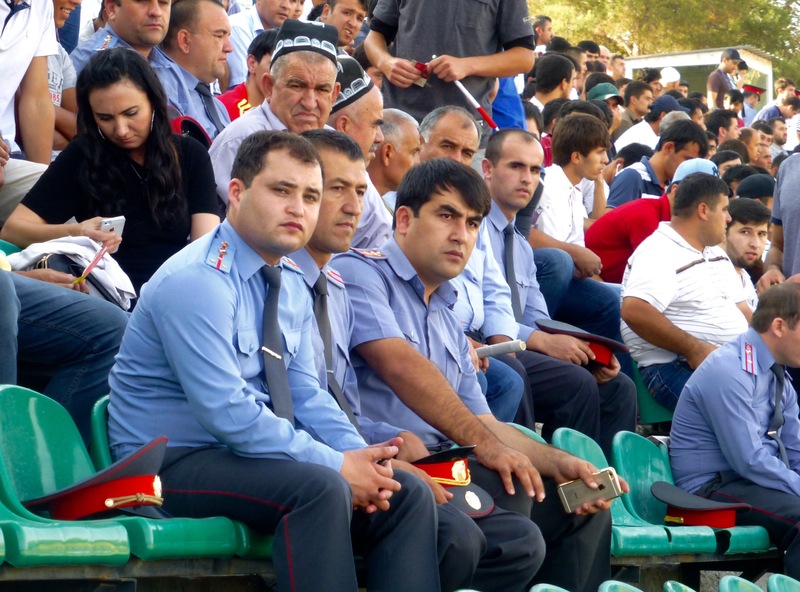 Not only do we have a great deal with Marian for our stay in Dushanbe, she also offers us tickets for the game. 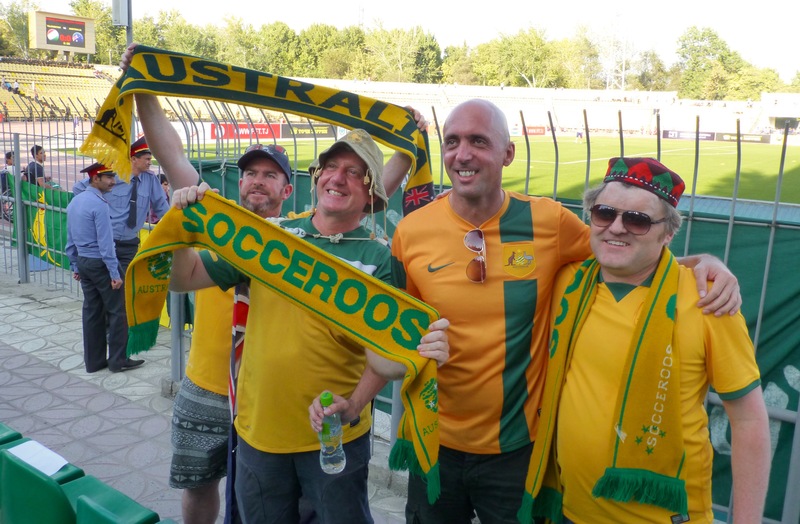 We have a fantastic evening (and a few more later on) supporting the Australian team with our new Aussie friends and even I enjoy the atmosphere in the stadium while not being a football enthusiast at all. Life treats us well again! Early start and fantastic weather: no wind and another day with clear-blue sky. 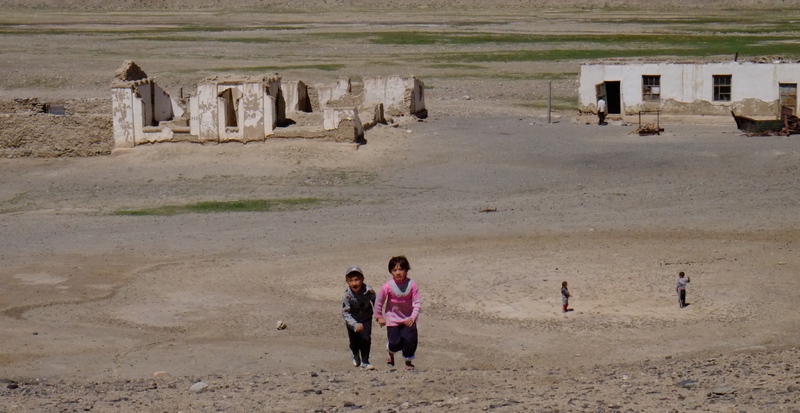 Shortly after Murghab we pass our first military checkpoint. 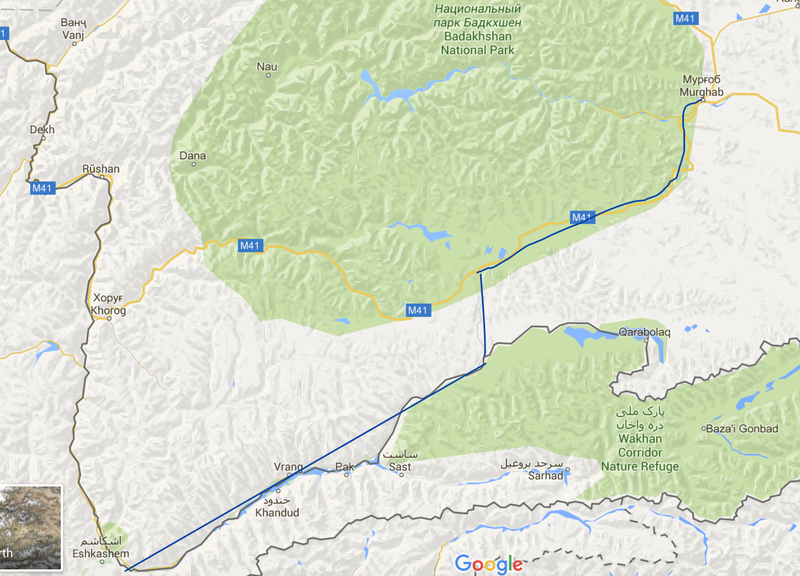 We are now cycling through the Gorno-Badakhshan Autonomous Region for which a permit is needed. Our passports are thoroughly checked, details entered into a journal and ten minutes later we continue. 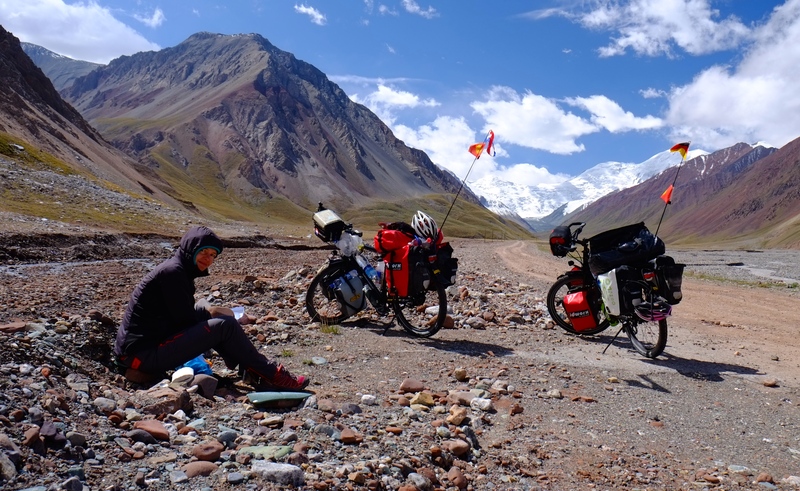 We pedal up our first pass of today of 3600m, a piece of cake as we start climbing at 3500m. 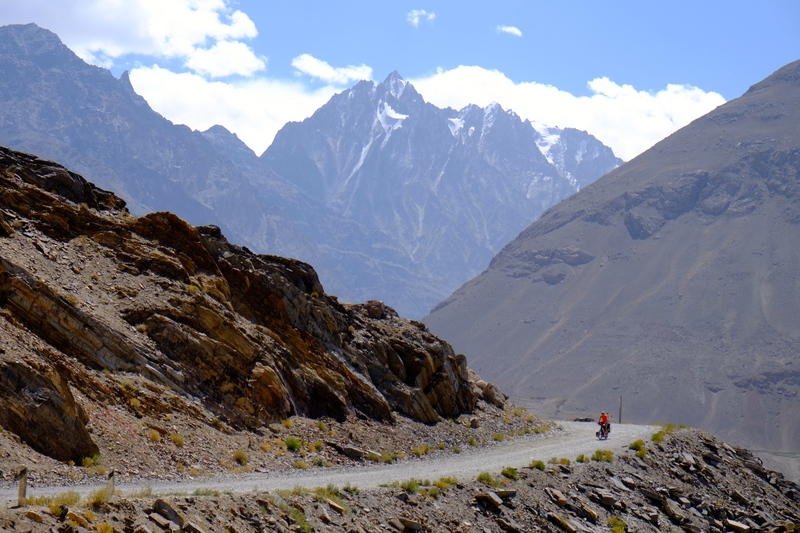 The coming hours the road is undulating uphill through a valley, we cycle through small canyons and to our left and right are red rocky mountains. Again hardly any vegetation, only a few thistles, succulents and grasses line the road. 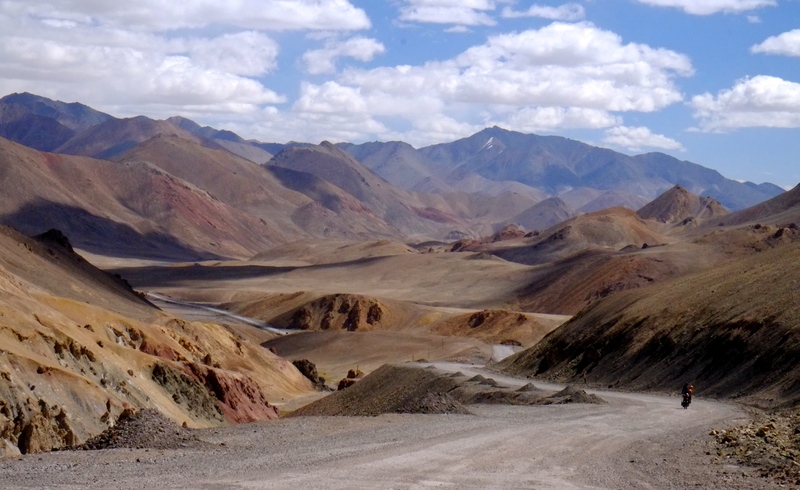 After the second pass of over 4100m the landscape becomes boring with a wide valley and brownish mountains around us. 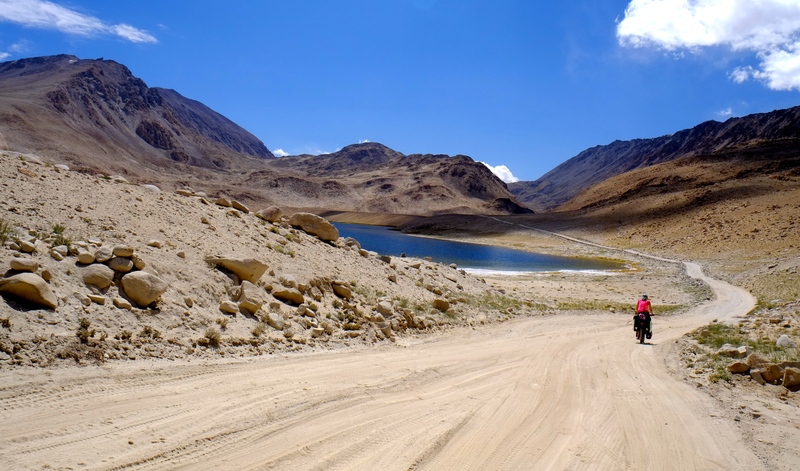 We feel a bit like in the movie ‘Groundhog Day’ as the road follows the same pattern over and over again: uphill, then left and downhill, another right turn and then uphill again. 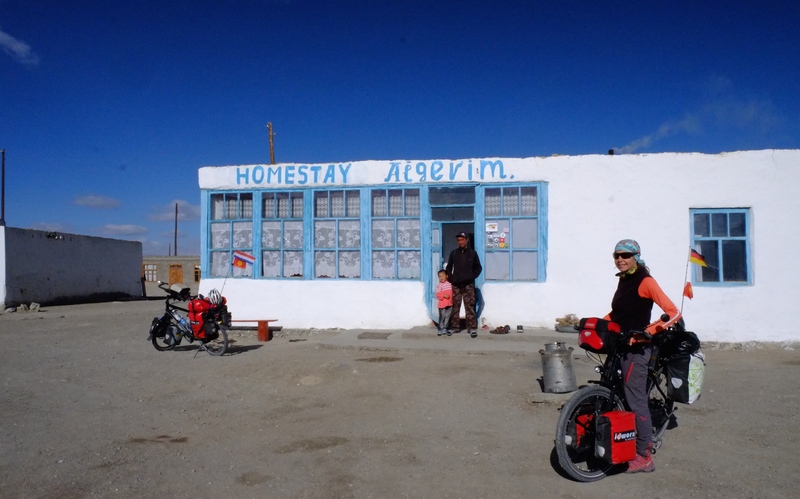 Despite the headwind as of 3pm we make good progress and end up at another homestay where we wash ourselves in the same room where we eat and sleep. We get two buckets, one filled with warm water. Our room also seems to be the only room where the phones can be charged and while Johan is standing naked in one of the buckets one after the other person tries to come in to check the status of the phones – of course without knocking on the door first. To avoid any embarrassments we watch the door until we are finished washing. The phone checking continues later on while we are trying to sleep. 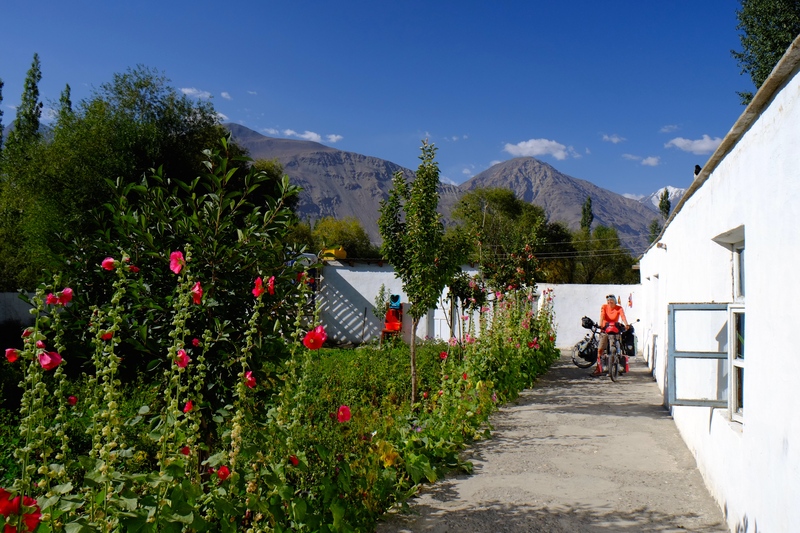 That evening we have a good laugh as we imagine all these interesting features of Tajik homestays to be added to our own B&B upon our return. 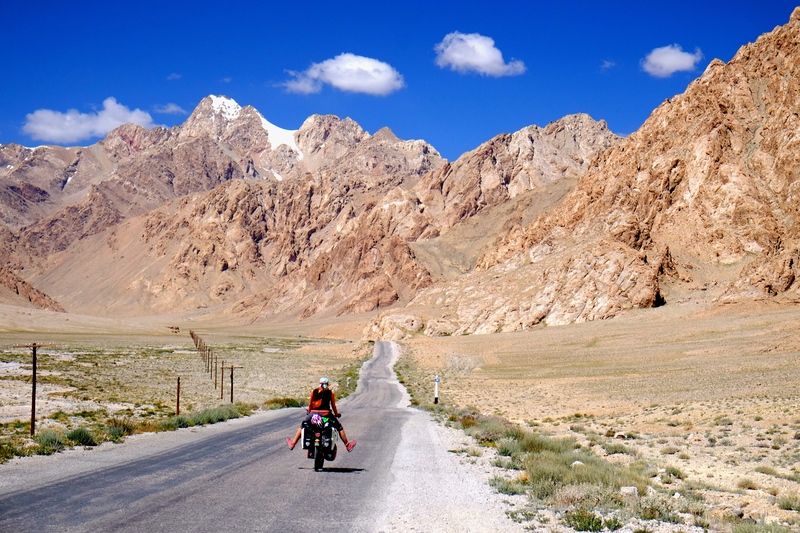 25 km asphalt and then we leave the Pamir Highway to cycle a loop through the Wakhan valley along the border of Afghanistan, only separated by the river Pamir. 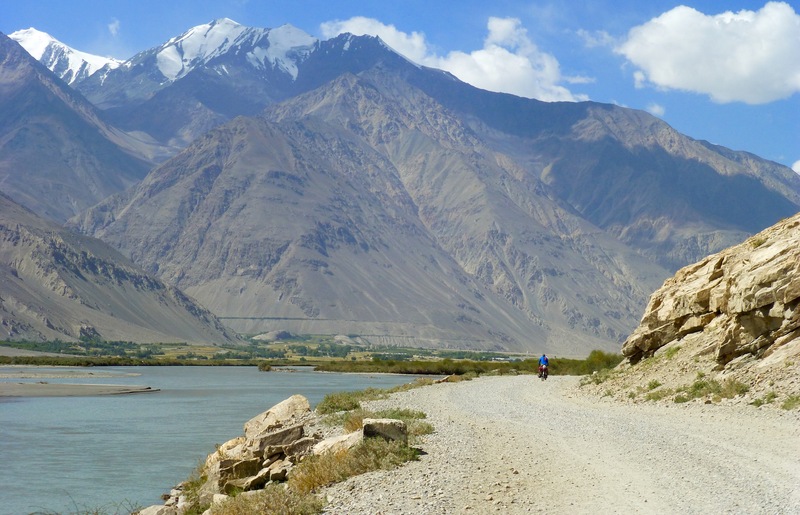 Other cyclists told us not to be worried about the Taliban as they can’t swim. So we don’t worry. 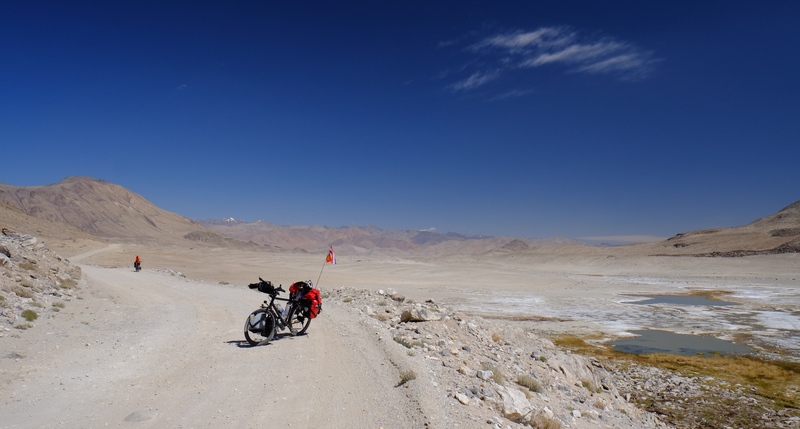 We first cycle on a pretty bad road through sand, over rocks, up and down and up again, along a few salt lakes until we finally reach the pass. 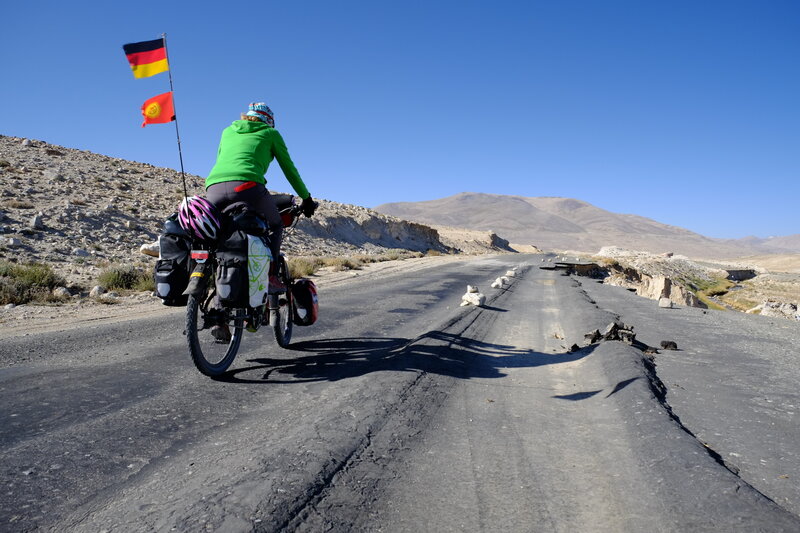 With a strong headwind and steep gradients we often have to push our bikes – now we know why they are called push bikes! 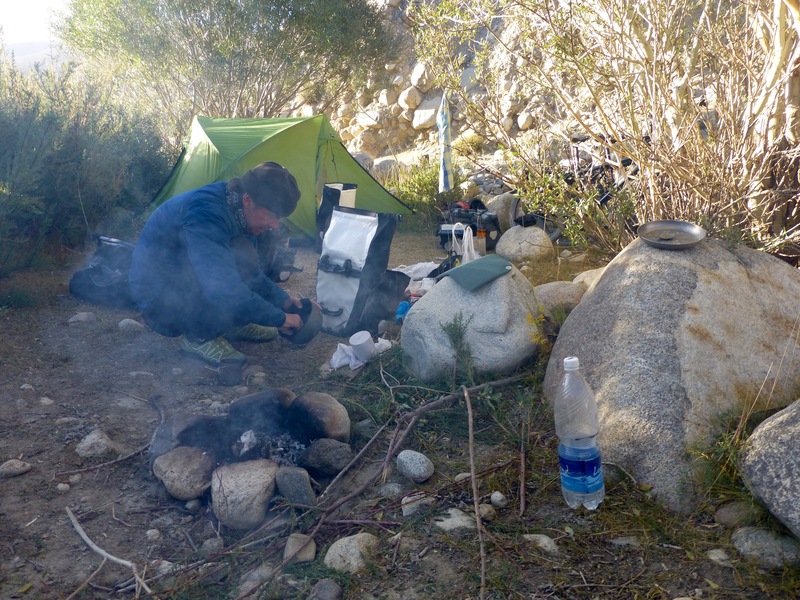 After the summit the weather doesn’t really improve but we move on to find a camp spot at lower altitude. 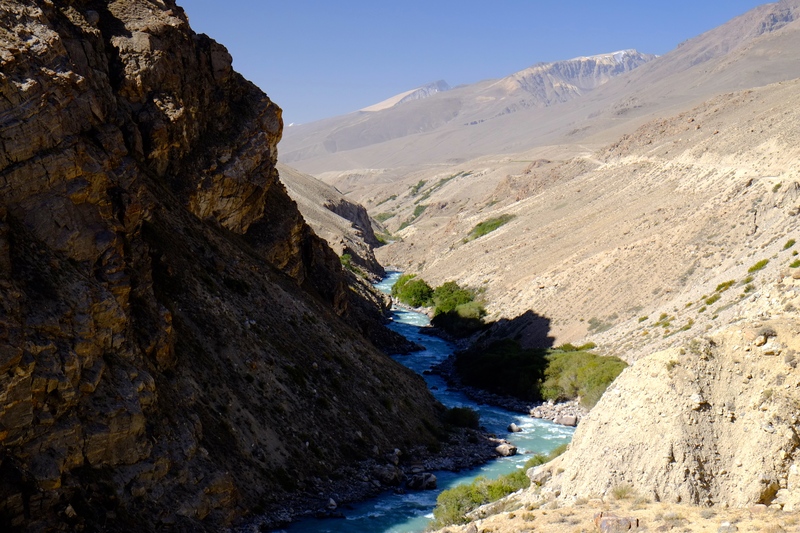 We pass another military checkpoint – this time with armed soldiers who are first asking for cigarettes and then for earphones – we pitch our tent with a vista of Afghanistan and the Pamir River. Traffic is almost non-existing: today we meet 5 French cyclists and 3 cars pass by. A day we don’t want to remember. 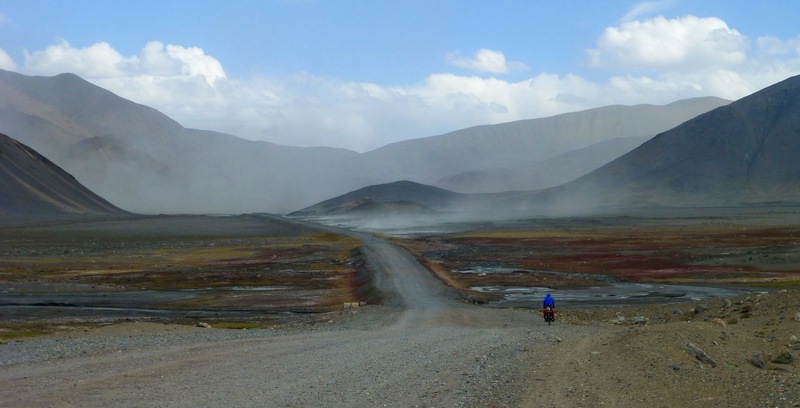 Extremely strong headwind and a maddening bad road prevents us from making any progress. 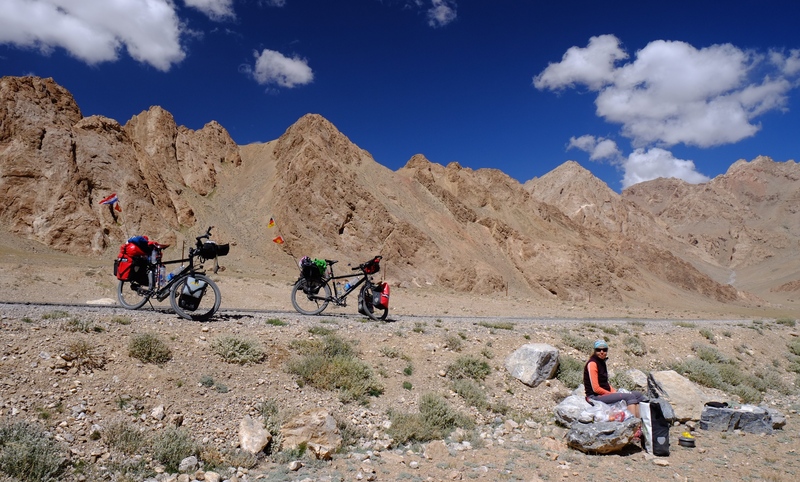 At 3pm we have a huge argument: Johan wants to continue for about 9km – the last hour we only cycled 3km – and I want to stop as we’ve been cycling to the limit for the past days. 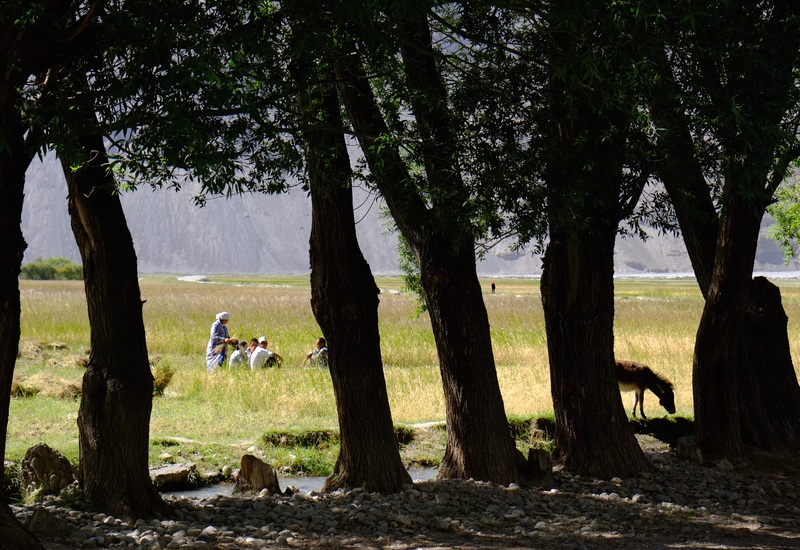 Shortly afterwards we find the perfect spot for our camp next to a river and hidden under trees. At night Johan wakes up with a start as he dreamed that the Taliban were trying to kidnap us and I wake up because I hear strange noises. For the rest of the night Johan keeps his knife in his hand to protect us from the evil. 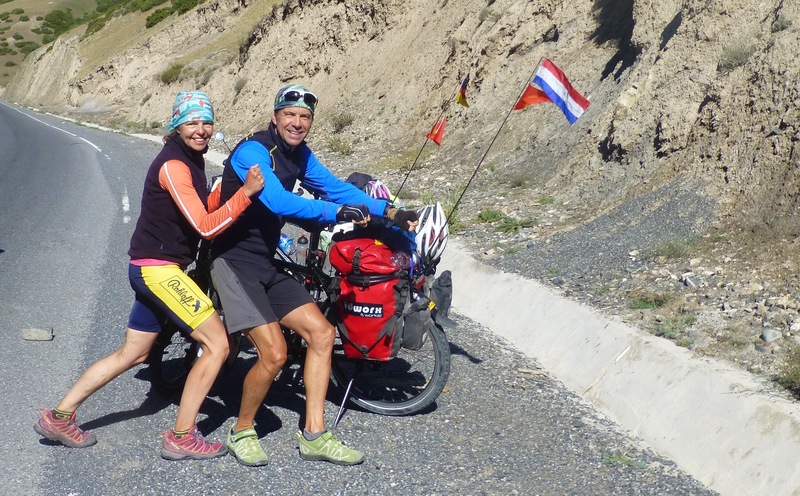 Today we meet one Dutch cyclist and two cars are passing by. 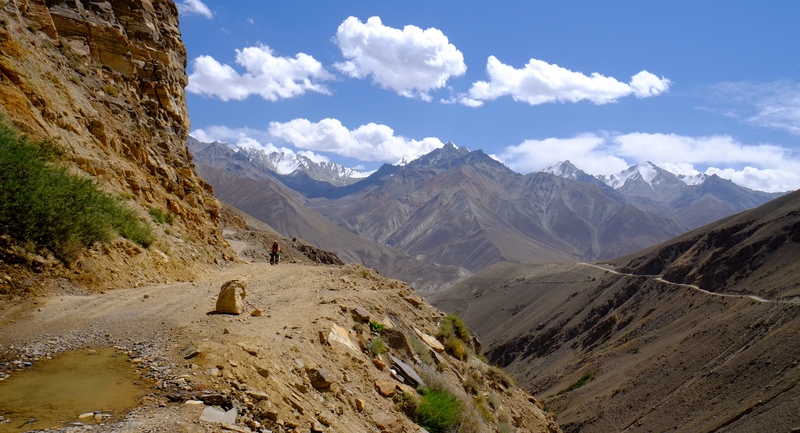 We are descending from 3600m to 2800m and are still climbing almost 400m! Does that make any sense? We keep meeting cyclists who tell us we would only descend as from now and they lied! We promise each other to tell the next cyclist that they would soon cycle on tarmac again and that the next pass is a piece of cake! 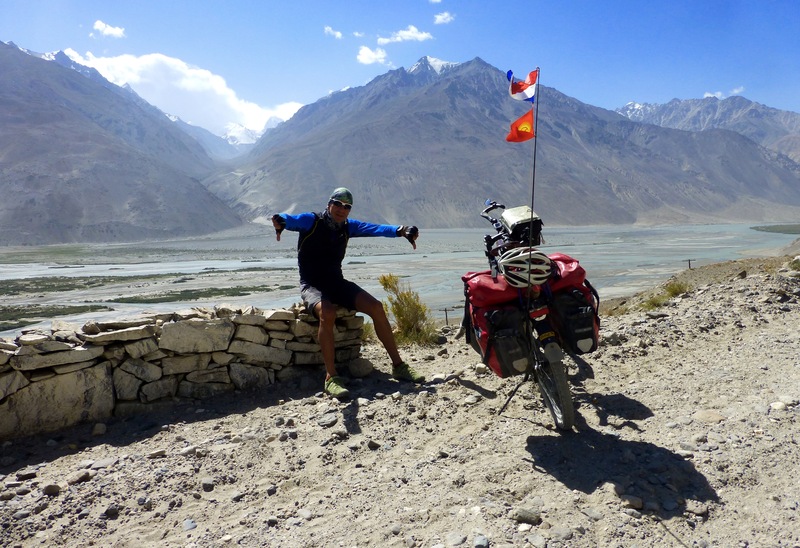 Other than that the day is great, well rested legs, no wind all morning and scenic surroundings, looking all day at the infamous mountain range Hindukush and the roaring turquoise river Pamir – at least when the road allows. 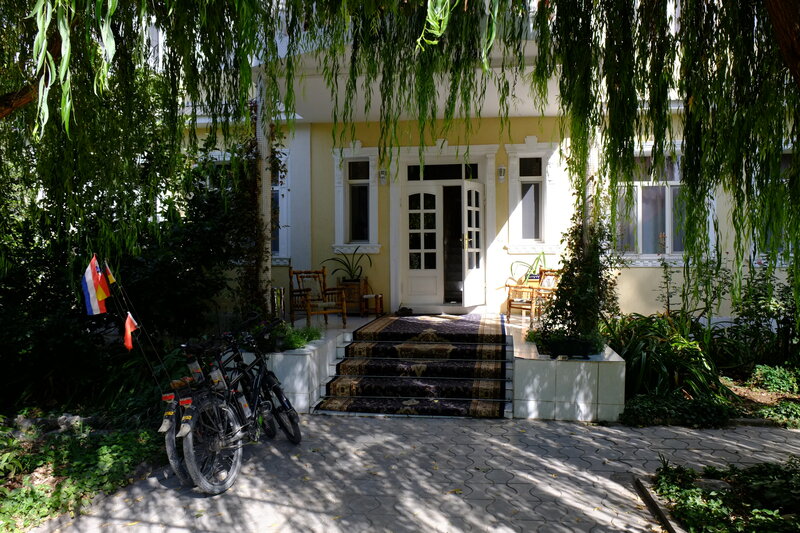 In the evening we check-in at a homestay with a perfect German-speaking landlady. A film crew from the German TV station mdr shooting a mountaineering documentary has checked in as well and we spend a nice evening chatting with them. Today it’s been busy on the road: 2 French and 2 Swiss cyclists, 7 cars and 3 trucks full of workers at the back. Can you find the little cyclist? Late start and never-ending bad roads. Whoever told us that the roads would become better after Langar is a liar. 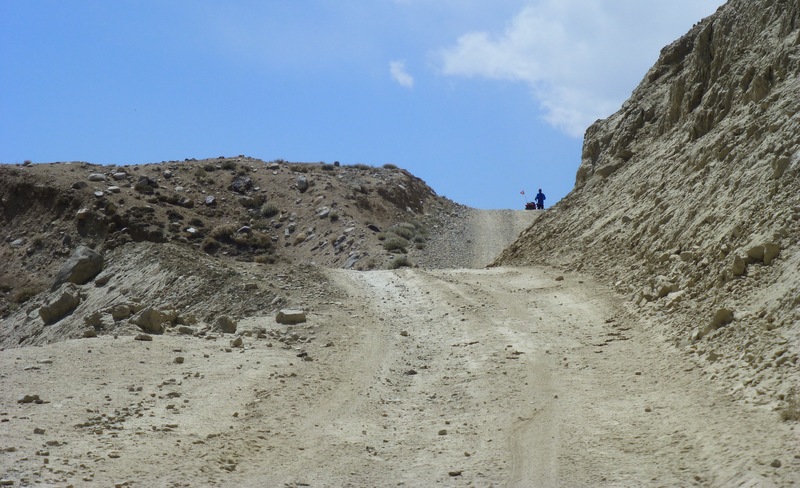 Either we go through sand, over huge rocks, washboard or 20cm deep gravel. 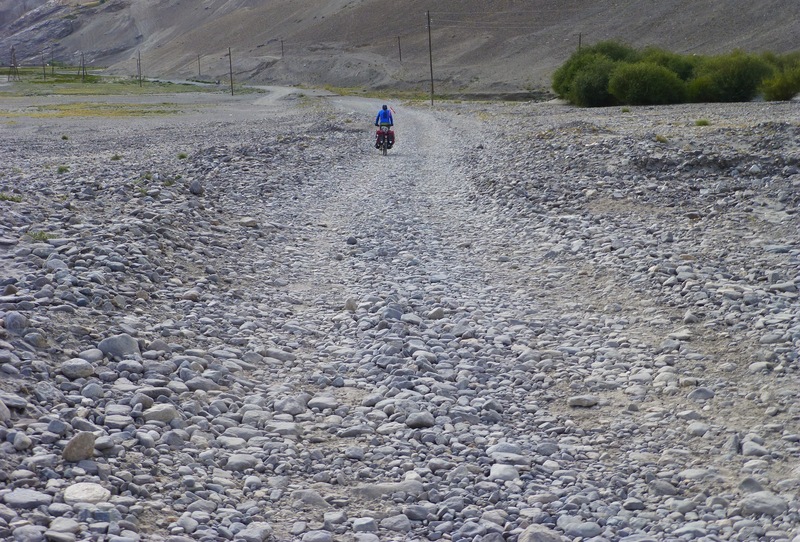 And yes, there is some asphalt as well, but that is melting, so once again no pleasure to ride on. 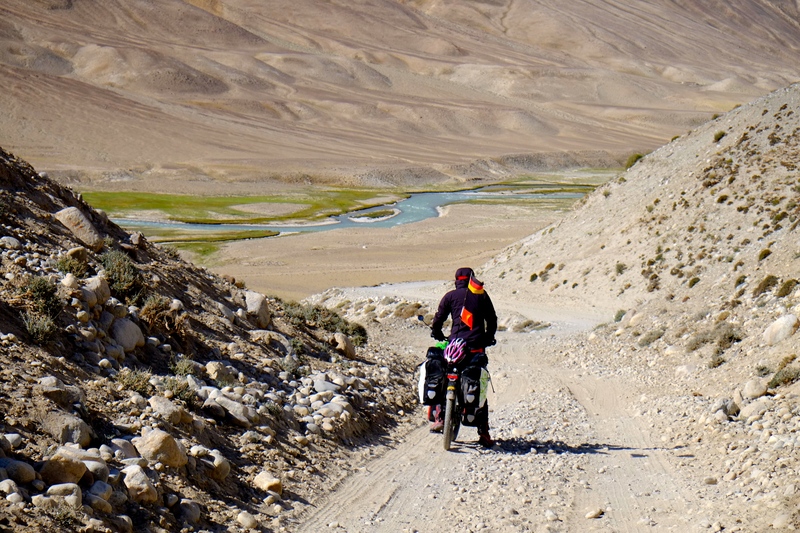 By the evening our bottoms are sore and hours later we are still shaky from the bumpy roads. But enough ranting. The landscape has changed a lot. 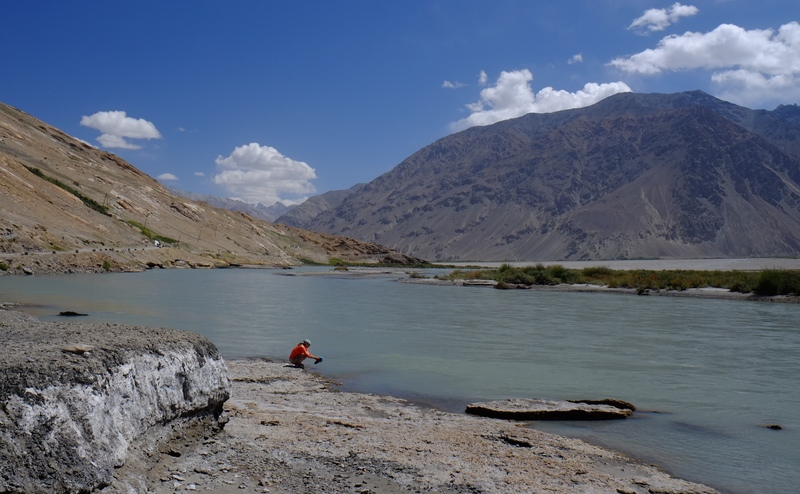 We are now at the wide river Panj, again marking the border between Afghanistan and Tajikistan. 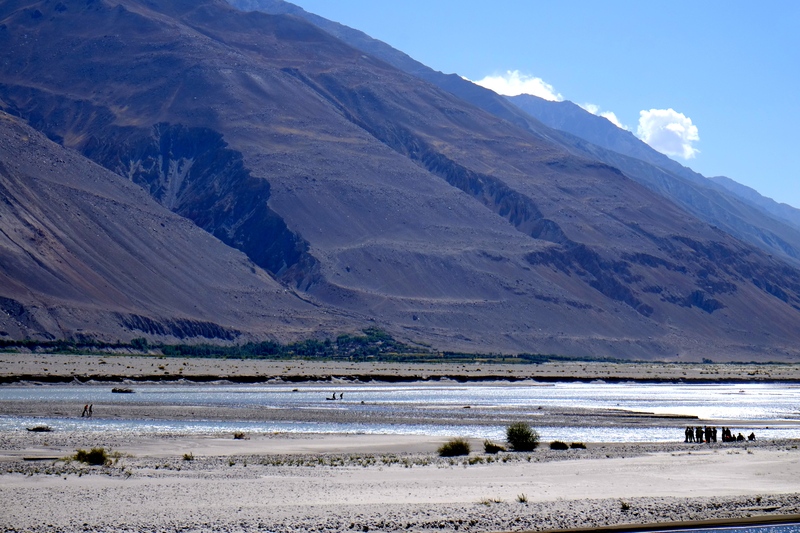 The valley is semi-arid and apart from occasional clusters of shrubs or willow, birch and other small trees the landscape remains barren. 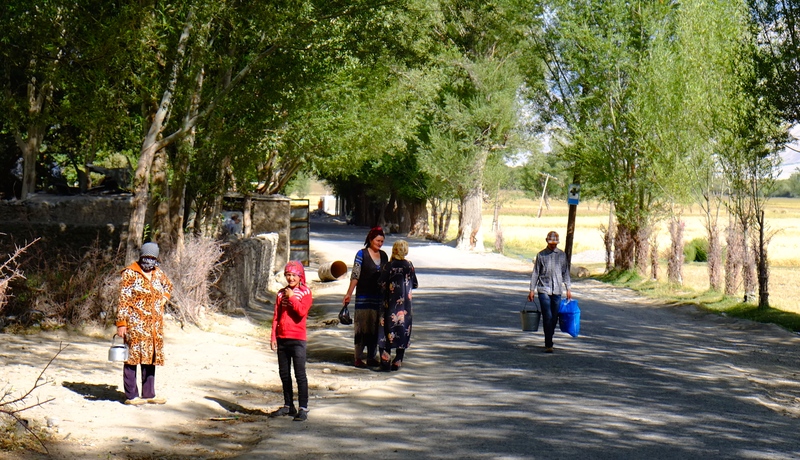 The villages that emerge every few kilometers seem like small oases to us with all the trees, fields and vegetable gardens we haven’t seen since Osh two weeks ago. 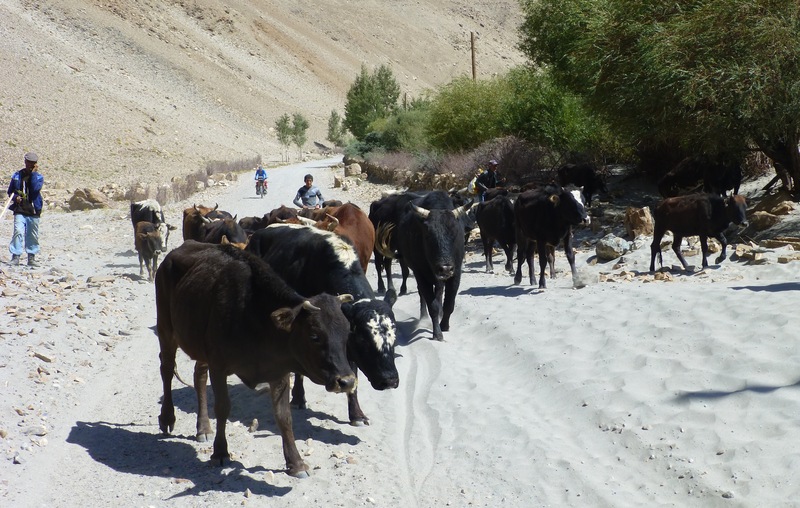 Between two villages we see about 10 to 15 men far away at the river, a rubber boat trying to get to the Tajikistan shore and five big 4WD cars waiting next to the road. My first thought is that they are fishing, but Johan’s got a better idea: the men are smuggling drugs from Afghanistan to Tajikistan. 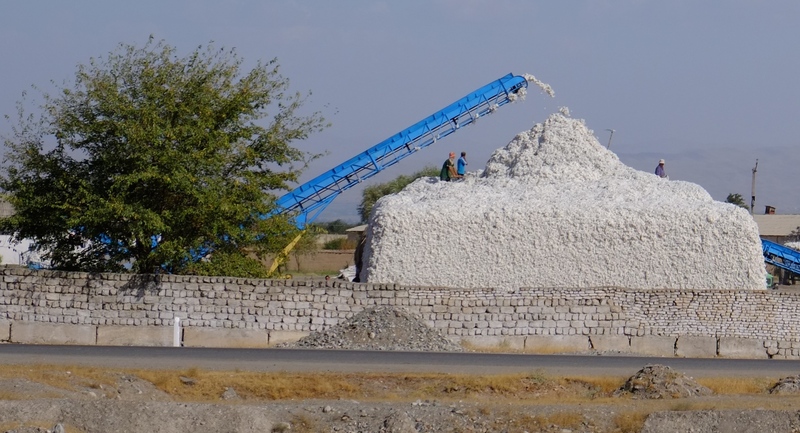 It is estimated that as much as 50% of Tajikistan’s economic activity in the last decade was linked to Afghanistan’s narcotic trade. We try to get away from there as quickly as the road allows. 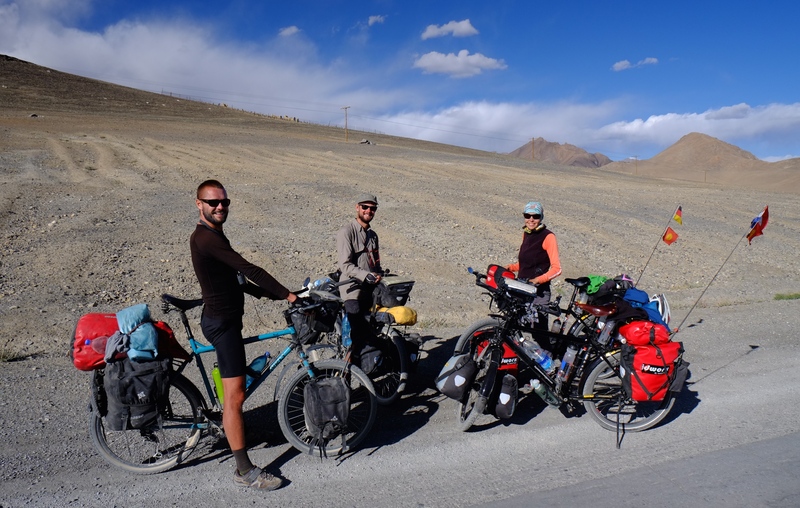 Today we meet a group of supported German cyclists, 1 truck and about 20 – 30 cars. And here is the evidence: smugglers! At the end of another exhausting day we get served fried potatoes swimming in oil with old bread and cucumber salad, cookies and tea. Another day we’d rather forget. We leave with Johan having severe stomach cramps on a sunny and stormy day. 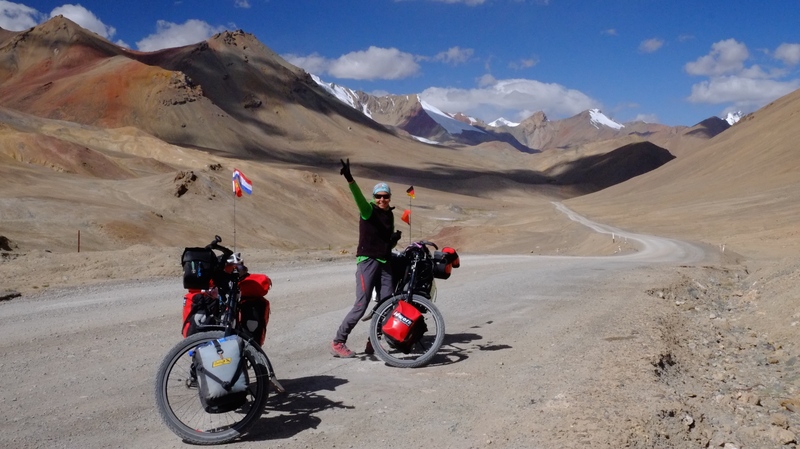 Guess what – we are cycling into the wind. Four hours later we are just 18km further, having pushed our bikes up most of the time due to the storm. Johan marks the road as I did a few days ago. 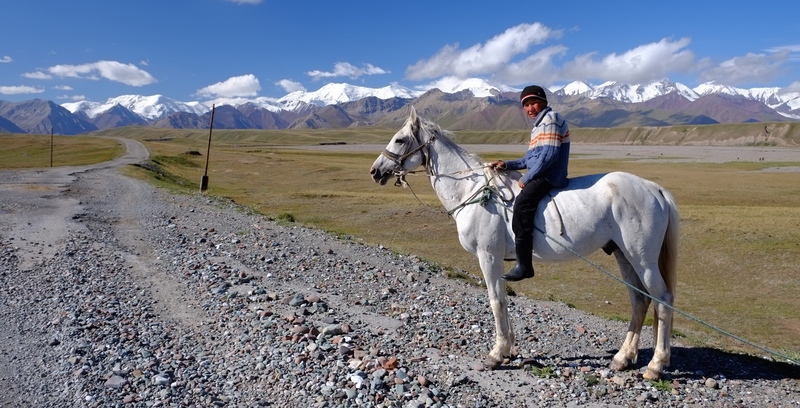 We hire a taxi to Ishkashim as we know we won’t make it by bike, given the weather and road circumstances. …and sand. 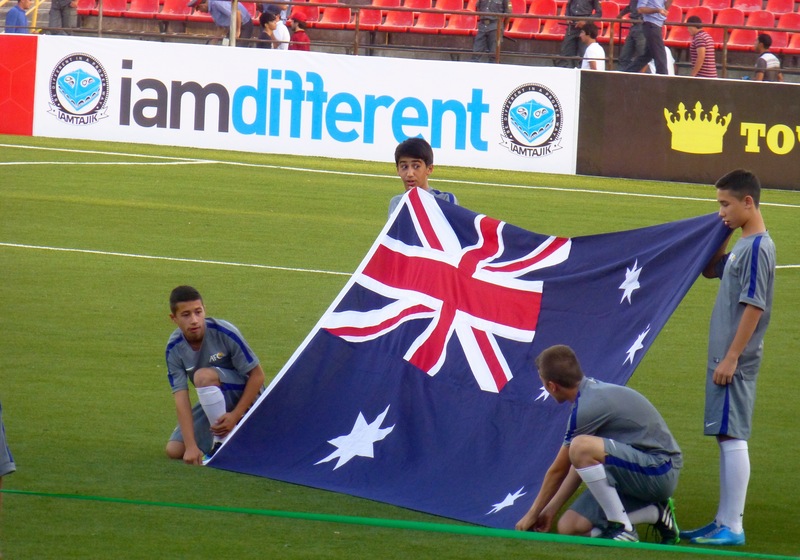 And have a look at our flags, sigh! A late start and a tremendous headwind prevents us from making any progress. 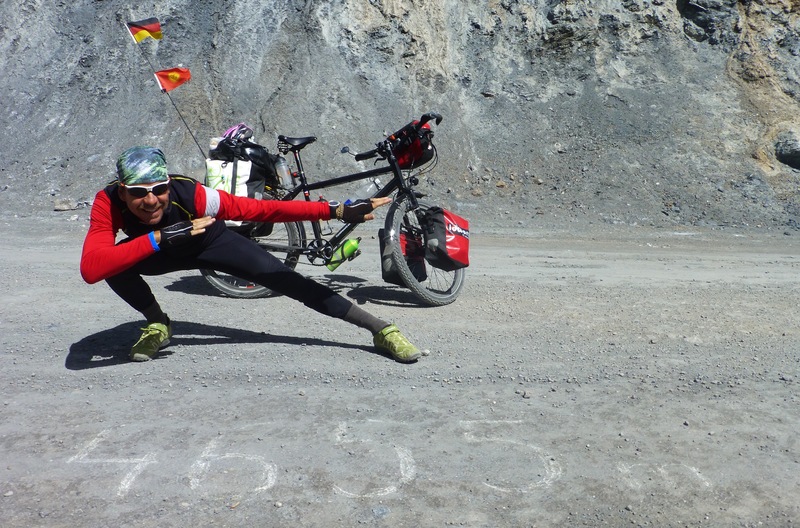 We meet two Austrian cyclists and Eddy (not Merckx) from Belgium who are today’s lucky ones. We get updates on the road and continue. Extreme washboard after 40km doesn’t help us and I get weaker and weaker and even start walking at times as it is easier than cycling against this wind. 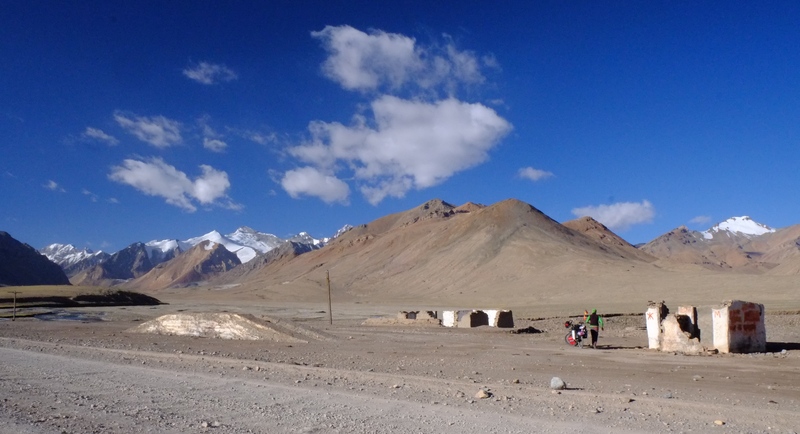 Right before the pass we see a farmer’s camp and decide to call it a day. Johan and I agree to pitch the tent and cook ourselves and five minutes later Johan ‘books’ us into the hut including half-board for around 7 EUR. At first happy to be be done for the day, we would soon regret it. 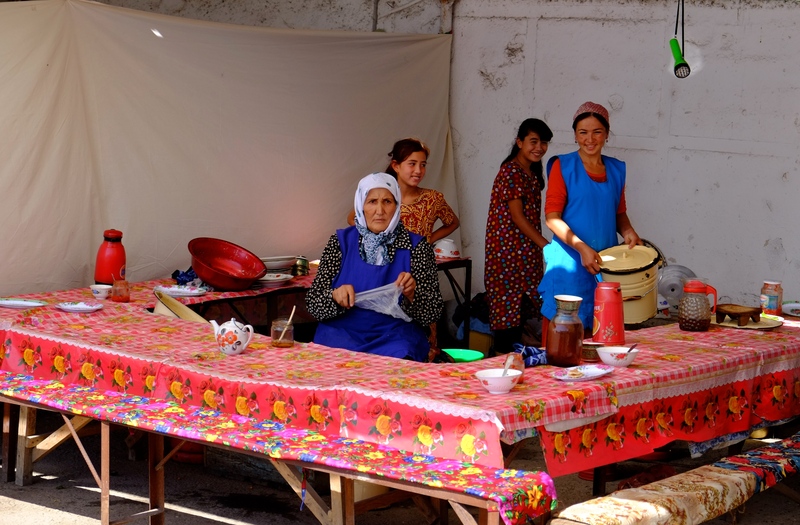 The people are very hospitable, prepare chai for us which is served with bread, kefir and butter. 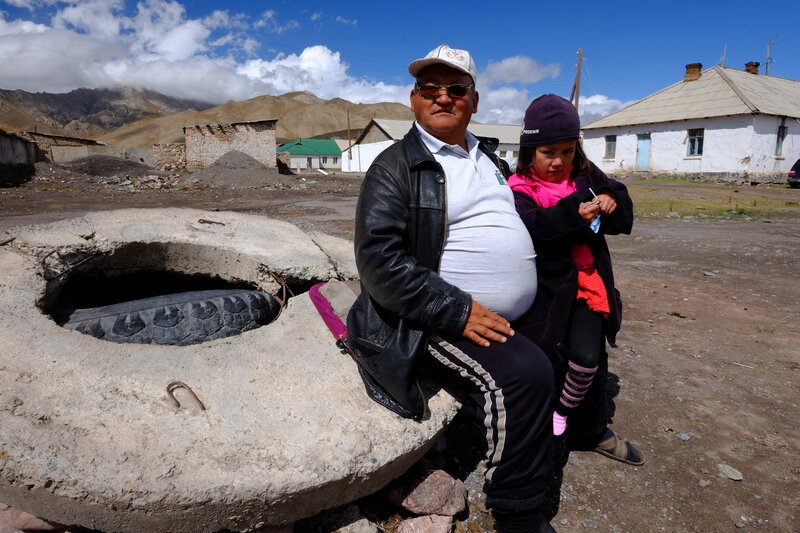 We relax in the overheated hut at temperatures of around 30 degrees but almost suffocate from the exhaust of the little oven used for cooking and heating. We can’t wash ourselves so we endure and soon dinner is served. Again chai and bread and a kind of ravioli filled with meat and onions. A tasty but greasy dish. Right after dinner our bed is being prepared next to the dining table. The 10-year-old daughter lays out many thick blankets and pillows on the floor and indicates that we now can go to sleep. The whole family is still sitting around the table eating and drinking and we feel a bit odd to go to bed, especially as we are still dressed in our cycling clothes and not keen on keeping them on all night. Not being able to wash has already been hard enough. We are being told another time to go to sleep and we finally obey. With low voices the family continues eating and firing the heating. After dinner the father lits a few cigarettes, farts with Johan laying right next to him and us almost dying with all our clothes on under two heavy blankets. About a sleepless hour later the family starts making their own sleeping arrangements, now stumbling over us as their bedding is right behind us. Finally ready, the daughter begins to talk endlessly for at least another hour, us still fully awake, but in the meantime secretly undressed under our blankets. 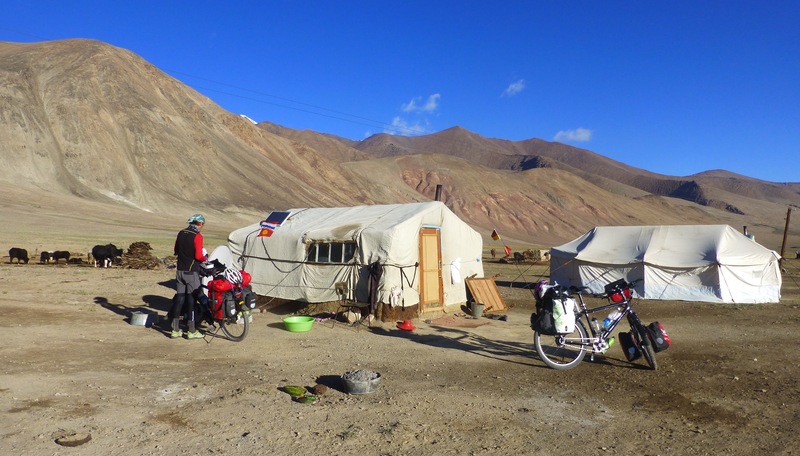 No way I could sleep in my sports bra and cycling shorts as our clothes pannier stands on the other side of the hut. Now I am only wearing my sweaty tee. Johan had been smart enough to bring his pyjama with him. My challenge now is to keep my naked bottom under the blanket and to get dressed on time the next morning. When the talking finally stops we hear another strange noise – the girl is peeing into a bowl right next to the beds. This procedure is being repeated several times and in the morning we get up more shattered than the evening before. 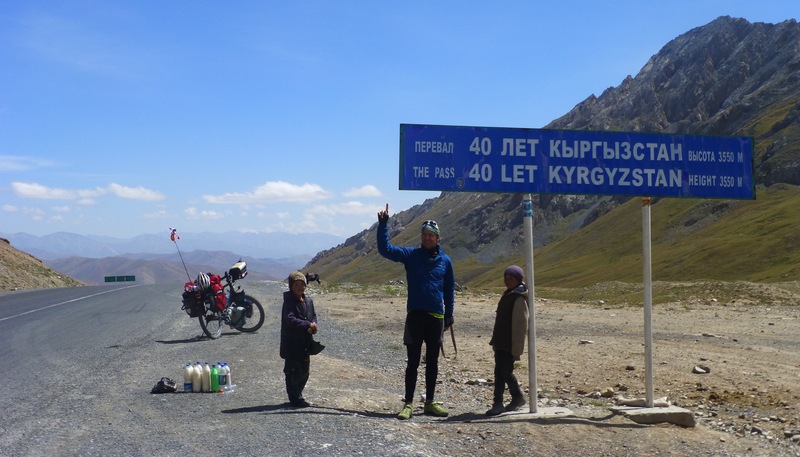 An altitude of 4100m and my beginning stomach problems most likely didn’t really help either. 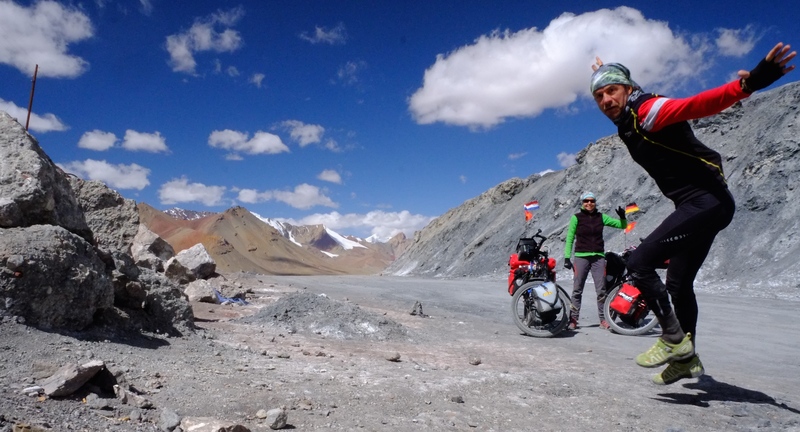 Today we would traverse our highest pass ever at an altitude of 4655m. As we leave early we start cycling without any wind. I feel very bad with stomach cramps and have to relieve myself right before the pass for the first time. 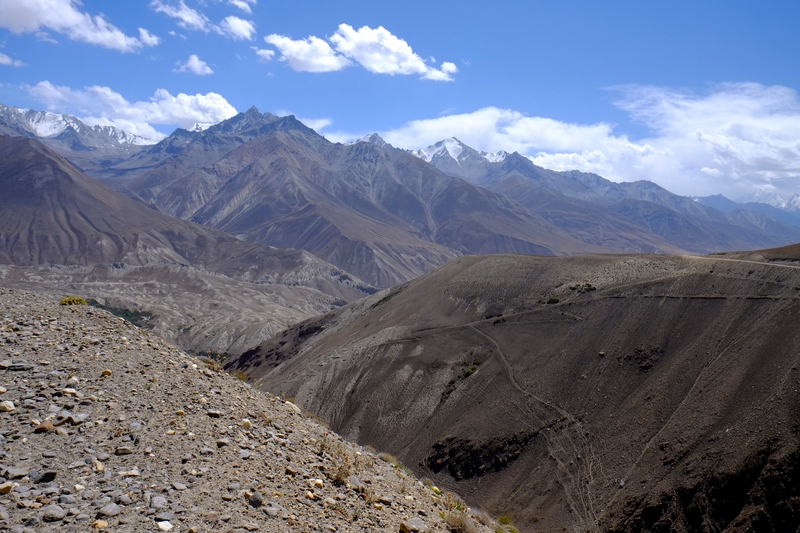 The climb is very difficult with very steep gradients and we walk several times. 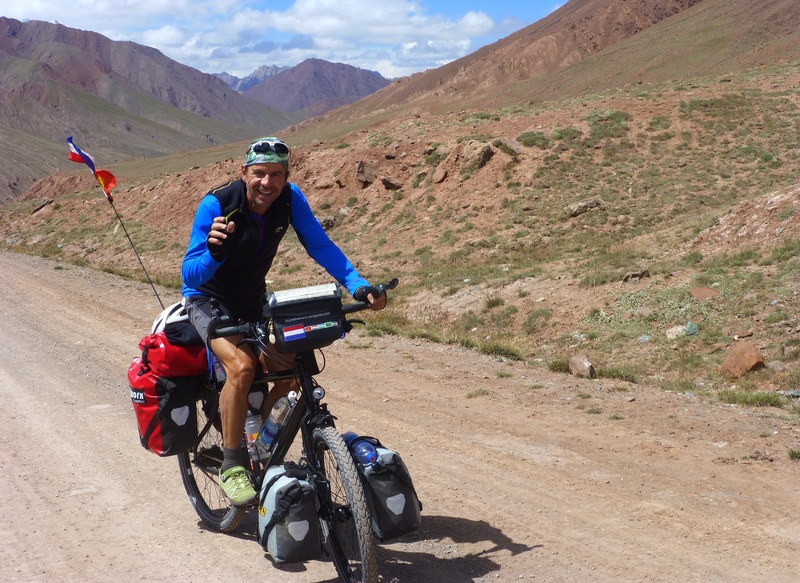 The altitude adds to the difficulty and we often only manage to cycle 50m before we rest again. 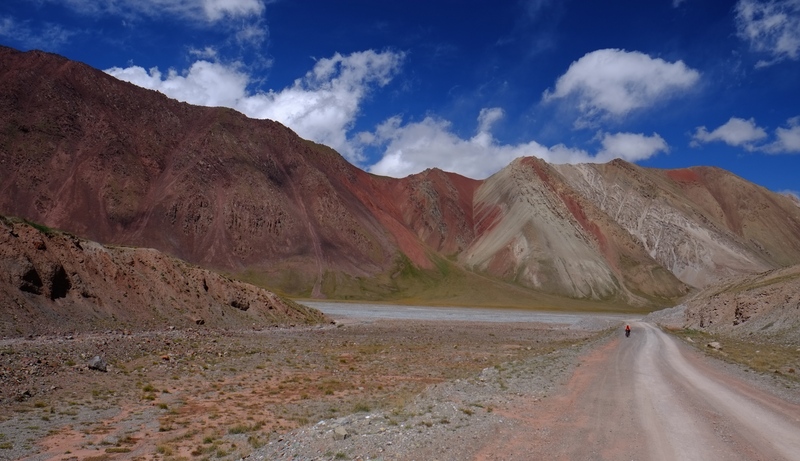 The landscape is surreal, red mountains that change colours with the light, hardly any vegetation and besides the funny whistles from the marmots that curiously watch us an eerie silence. 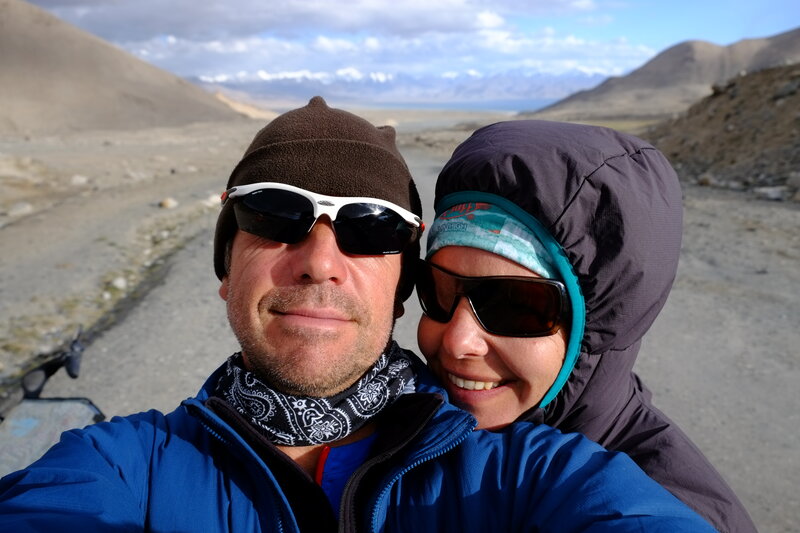 After 12.5 km we happily reach the summit and as from now it would only go down – altitude and health-wise. I start feeling like a dog as I leave a mark every few kilometers. After lunch we have our first strange encounter. About 500m ahead I see people standing on the road, there is nothing else close-by and I get a little worried not knowing what to expect. We both take out our pepper spray and cycle next to each other. Only a maximum of 10 to 20 cars are passing us each day and we know we are on our own. Getting closer we recognize two soldiers armed with machine guns standing and another man sitting on the road. As we approach, the sitting man gets up to let us pass. Johan greets ‚Salam’, they are all greeting back and we are gone with the wind. At around 3pm the wind picks up again and again it is headwind. 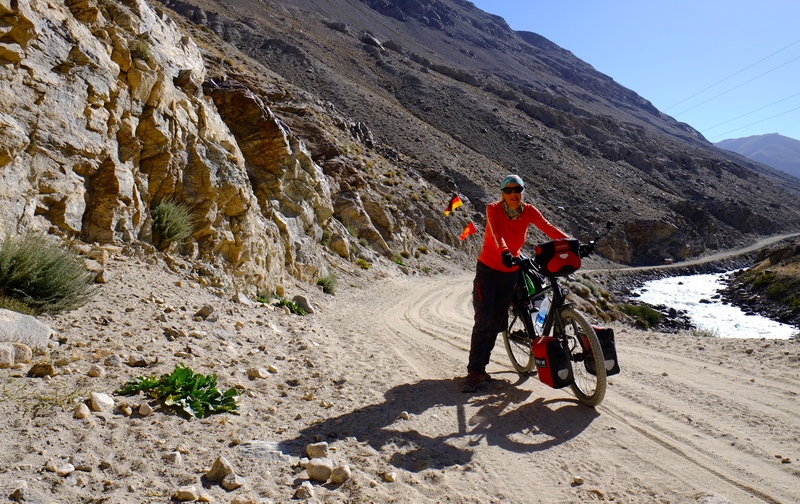 I am very exhausted as my diarrhoea is getting worse by the minute and knowing I still have to cycle at least 10km against the strong wind makes me break down for the first time on this trip. I can’t stop crying not knowing how to get to the next village. Johan tries to comfort me and we continue slowly with me cycling in his slipstream. When we finally see the village after the last bend in a valley tears keep running again. This time they are tears of joy. We are nearly there. This night I spend mostly on the loo – another sleepless night! 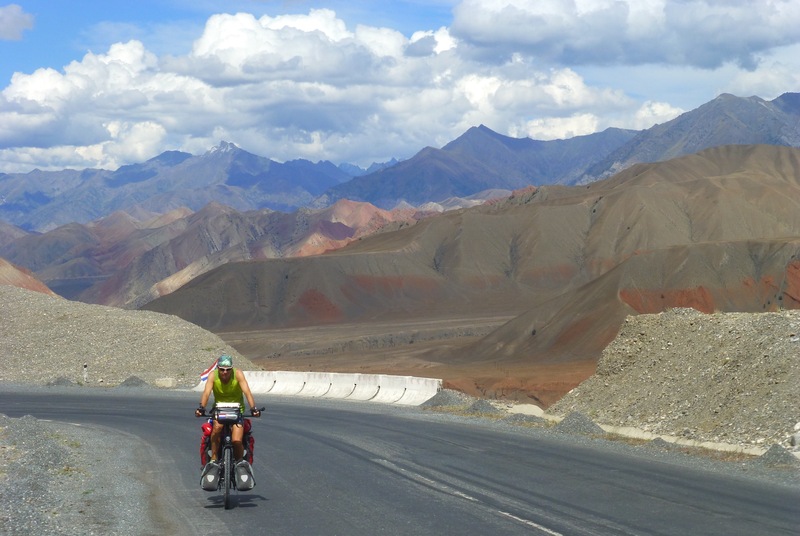 Long cycling days, food I should not have eaten, maybe contaminated water, headwinds, sleepless nights due to the altitude, the most demanding cycling ever on bad roads and a heavy bike had taken its toll. I am down with fever and the worst diarrhoea ever and we need to take two days off of cycling. 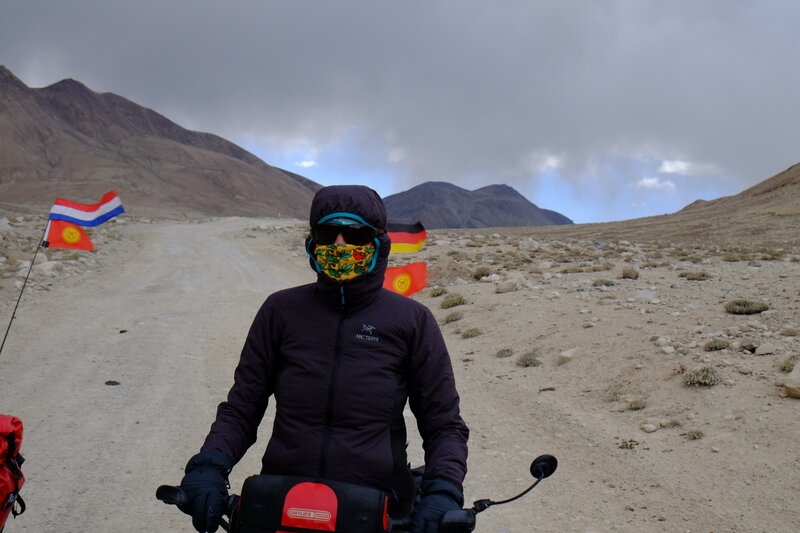 My symptoms correspond with the traveller’s diarrhoea and I start taking antibiotics which make me feel much better the second day and confident to be able to continue our journey tomorrow. 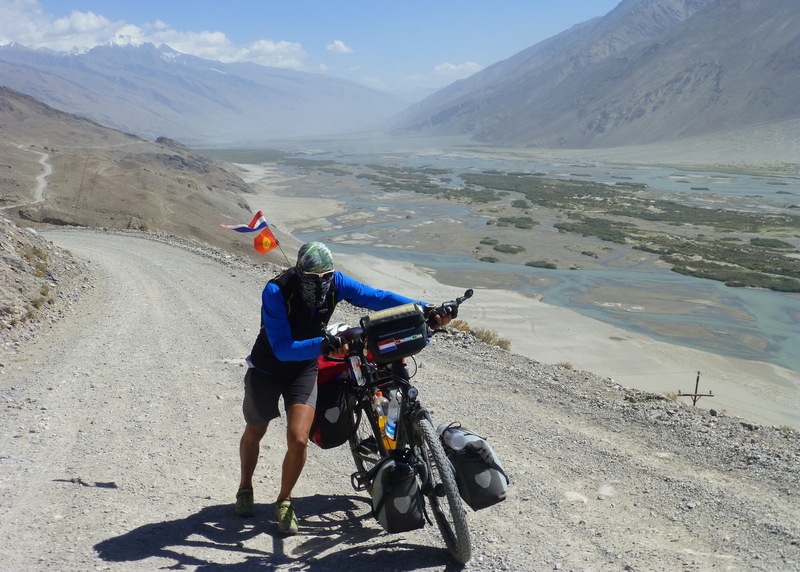 23 August – 8 September, 2015 – As the Pamir Highway has been an important milestone of our journey you’ll find below our diary entries with the highlights of every day presented in four different parts. We’re in doubts if we should leave as heavy rainfalls are forecast. 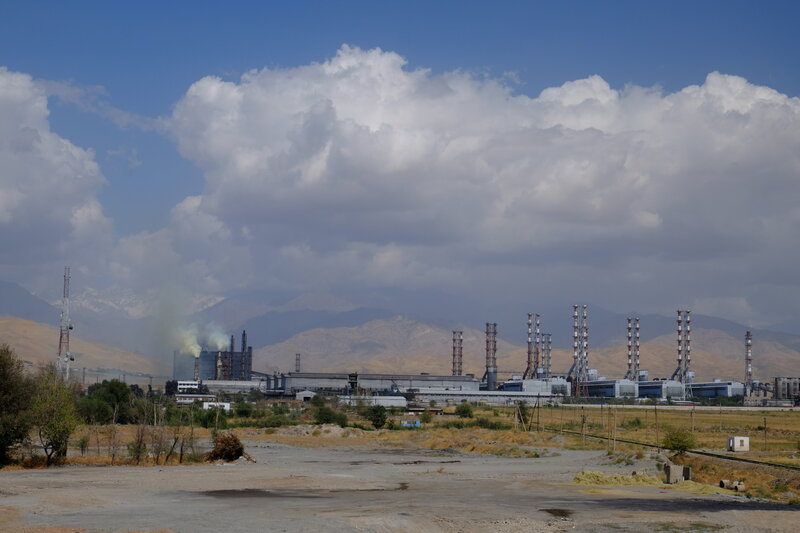 We anyway leave as we are on a tight schedule given our expiring Tajikistan visas and are happy we did as it doesn’t rain all day. 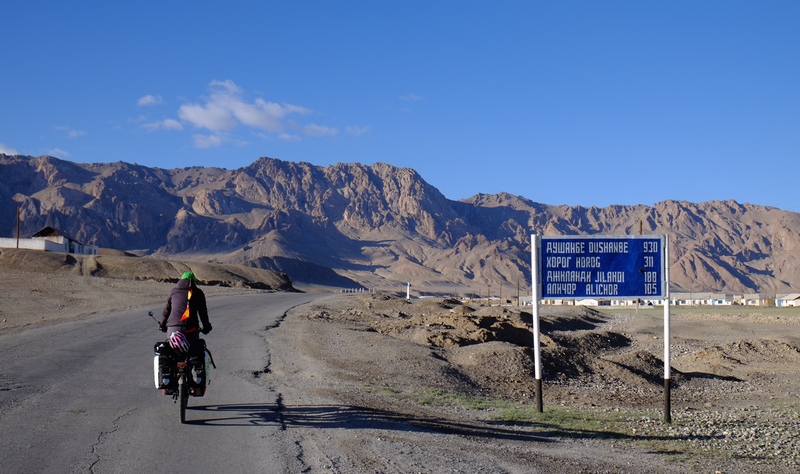 It’s a climbing day through desolate landscapes with small villages in a bad state, a pass of 2,389m and little tailwind. On our way we are given apples and carrots and meet an Irish-American cycling couple. 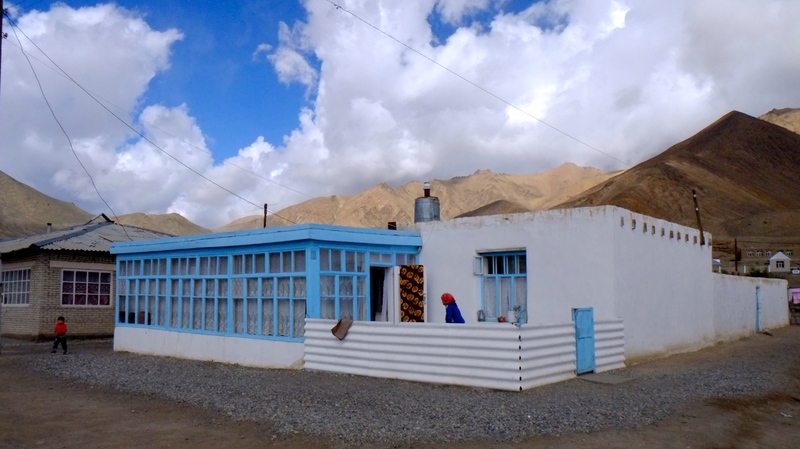 We are grateful for the guesthouse in Gulcha as we don’t have to cook ourselves as we are shattered after a long days’ cycling. Early start on a beautiful day with clear blue sky and no wind. 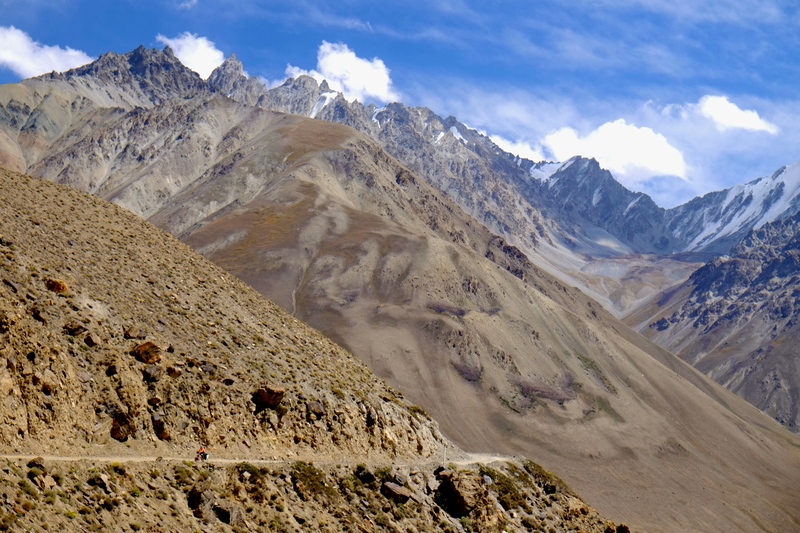 We continue on undulating roads through the Gulcha valley. 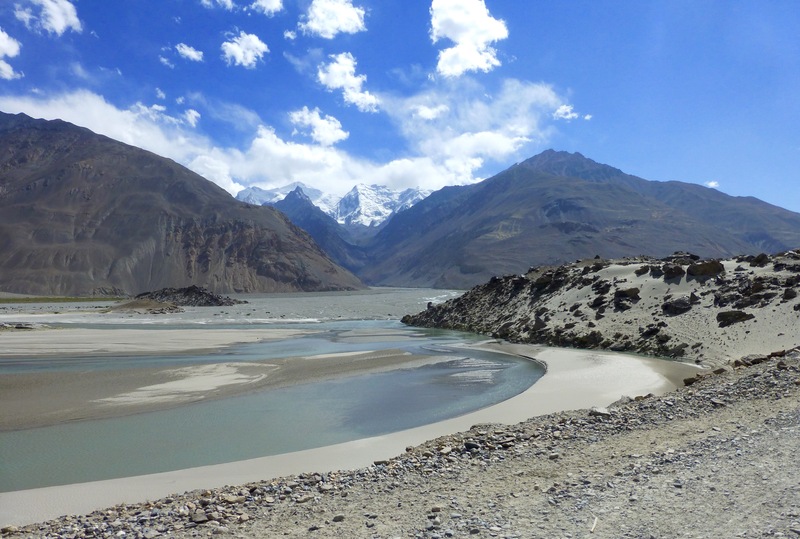 High mountains to the left and right, the valley narrows and opens up again to make room for another small village. Later the landscape reminds us on the deserts of California. 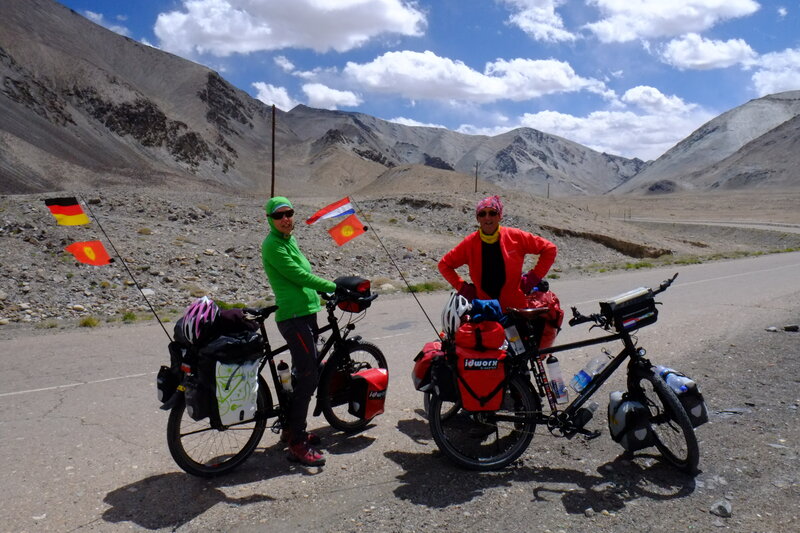 We are cycling into a strong headwind – one tailwind day had been too good for us. 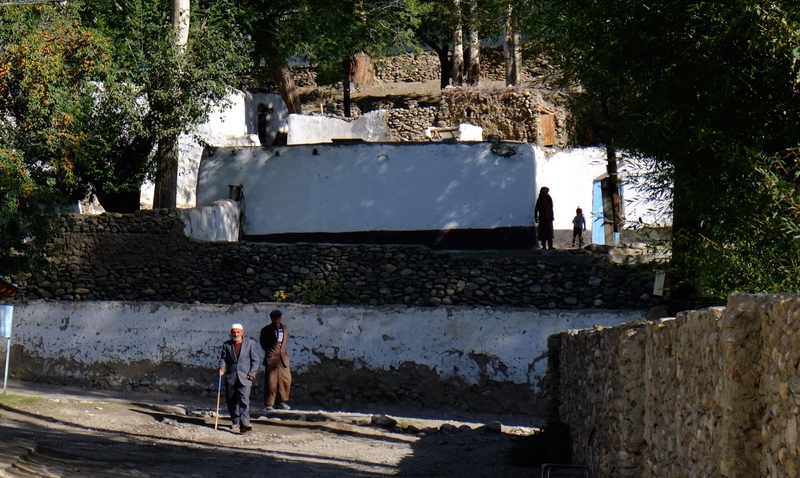 At the end of the afternoon we ask in the village for a place to sleep and the family invites us in. 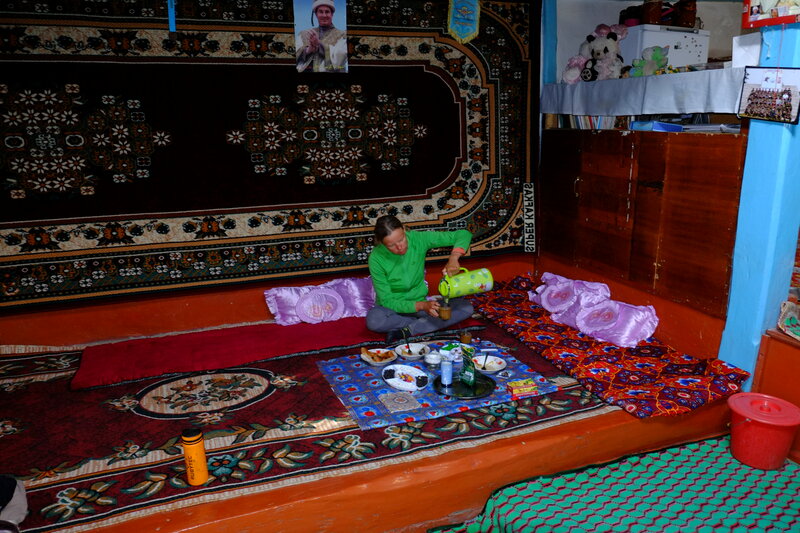 We get chai, cookies, fresh melon and soup and our own room to sleep. 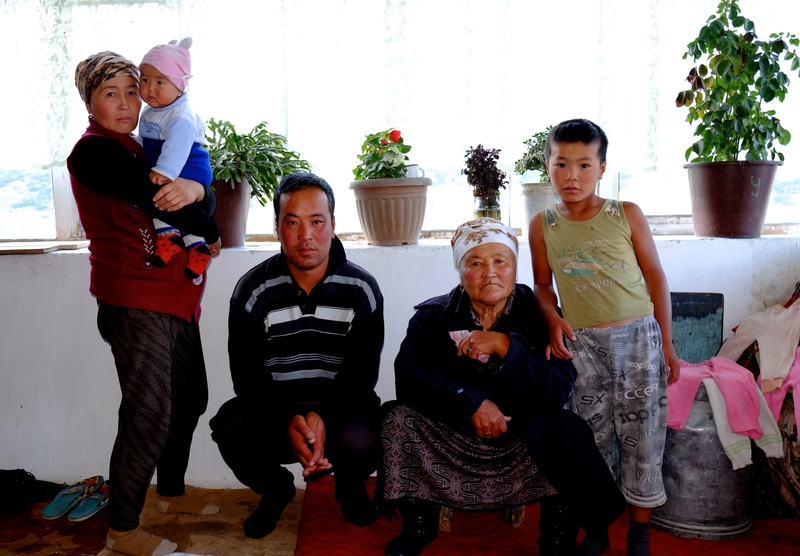 We love Kyrgyz hospitality. 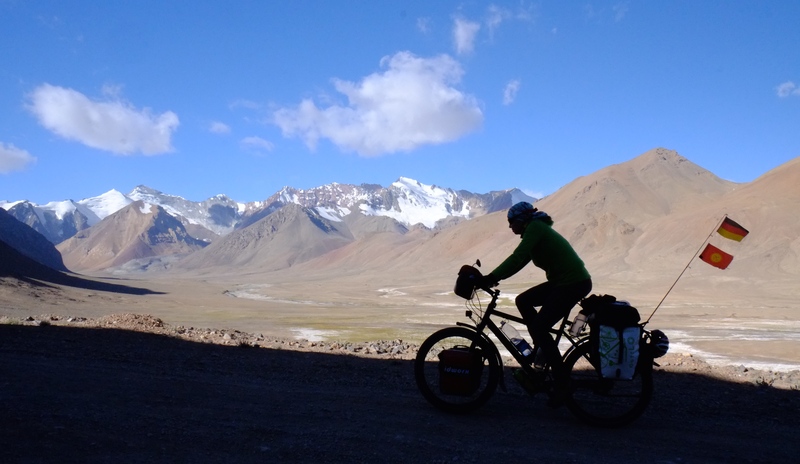 Another early start and with heavy legs we are climbing up another pass, again against the wind. Gradients are tough, most of the time at around 8%. After four hours we reach the top at 3615m, annoyed with the wind and the kids who are touching everything. 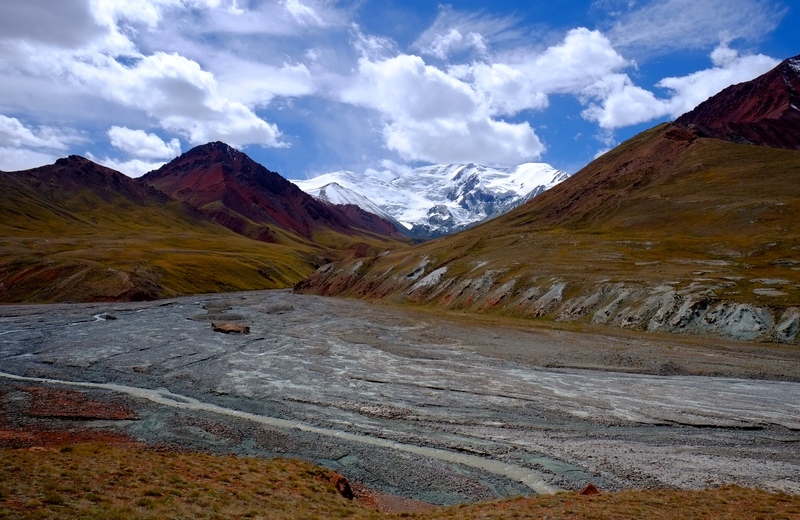 For the first time we see snow-capped Peak Lenin, the second highest mountain in Kyrgyzstan at 7134m. 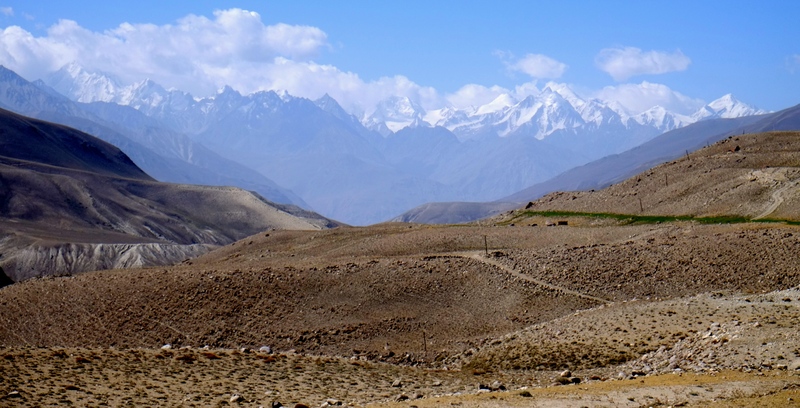 Later, Sary Tash offers superb views over a dazzling mountain horizon. 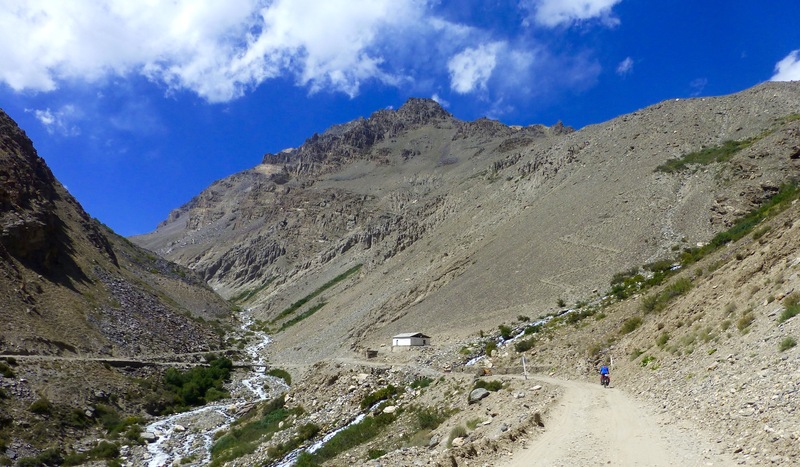 We finally go down, but only for three kilometers, then the road climbs for another two kilometers to the second peak at 3550m. What a deception! 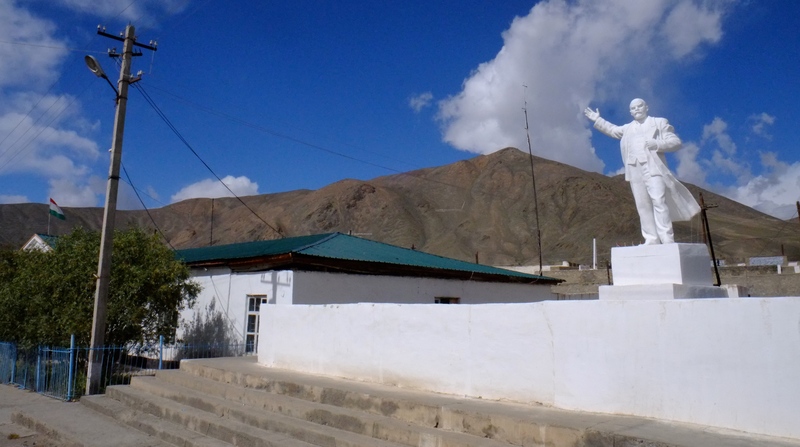 We arrive early, have lunch at our guesthouse, do the necessary shopping at one of the two shops that also serves as the local bar, money changer and telecom outlet. 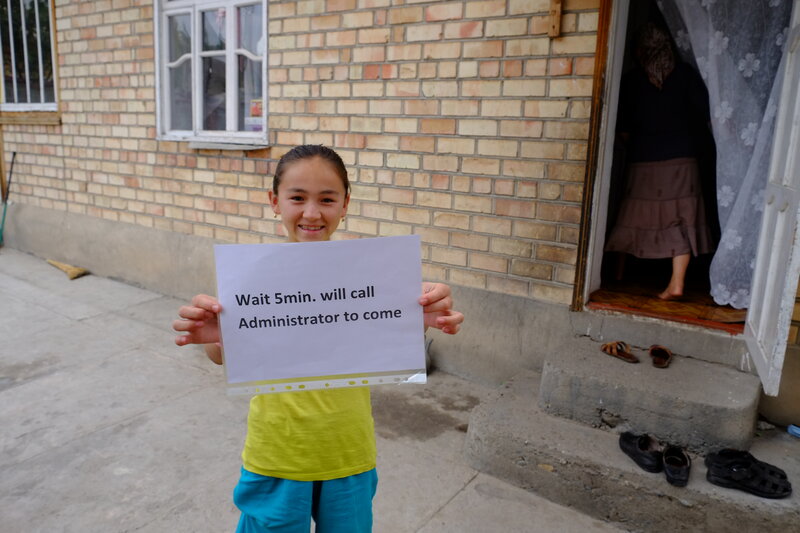 We are lucky as the shop owner’s husband seems to be shopping in Osh and every time we are asking for something that’s missing she is bellowing our order into her phone. We can pick it up the next morning at 7am. Another rest day at 3200m as it doesn’t look inviting to fight against the heavy storm and rain outside. 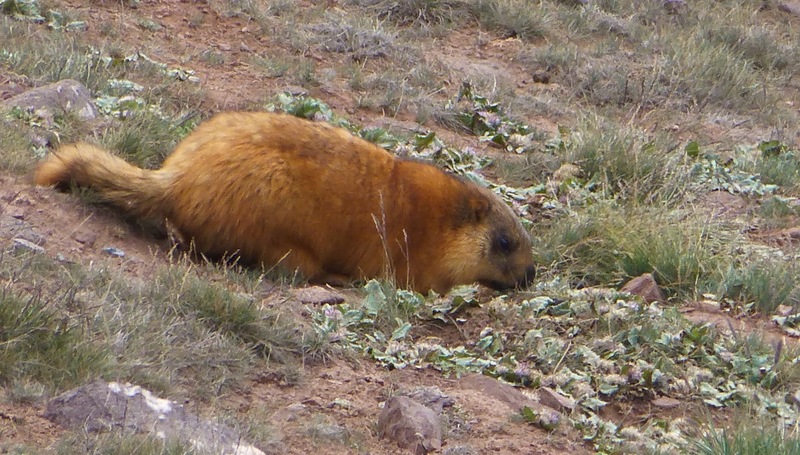 I don’t mind as it gives us more time to get adjusted to the altitude. 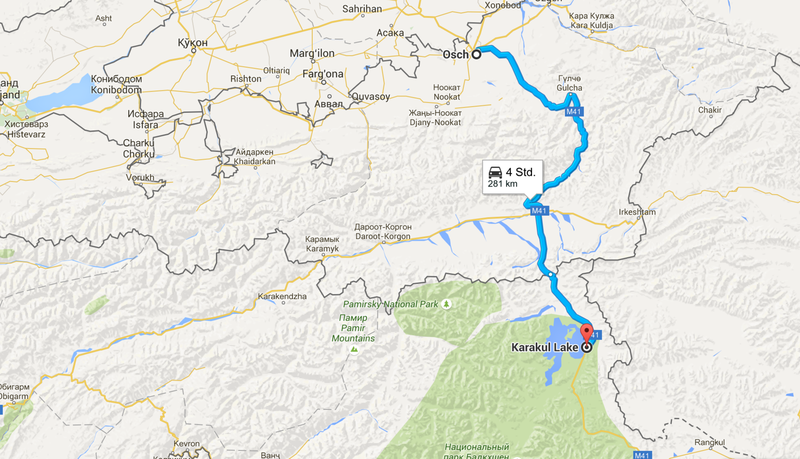 The coming days we’ll be at over 4000m. A beautiful day with a clear blue sky and rested legs – ideal to tackle two passes in one day. 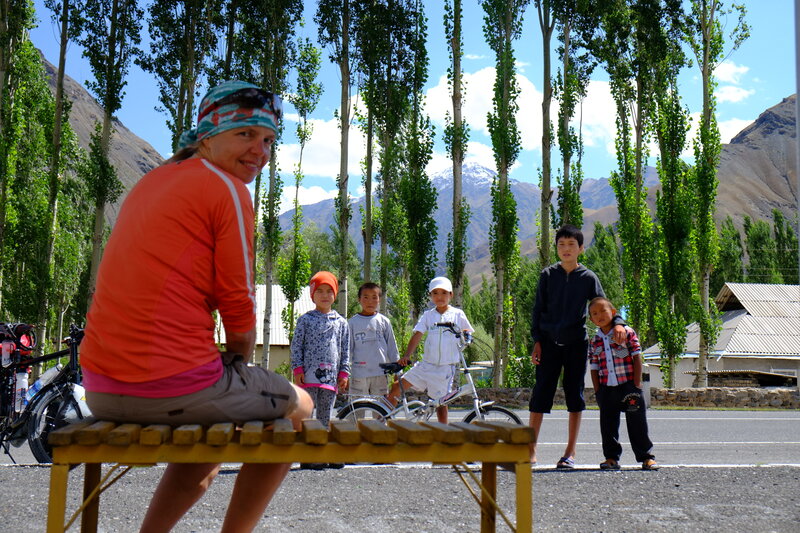 For about 20km we cycle with a view of the dazzling snow-capped mountain chain, to the right Peak Lenin. 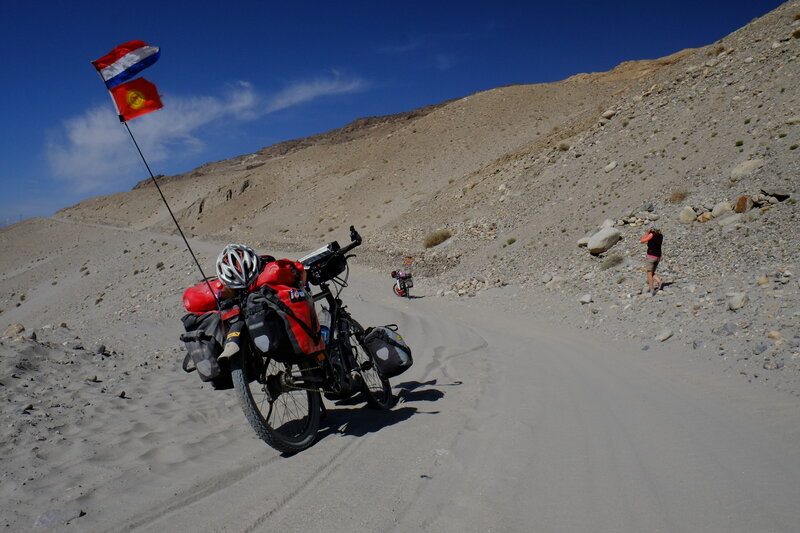 We pass the first border at 10:30 am without problems and shortly after start the climb of today’s first pass through 20km of no man’s land. 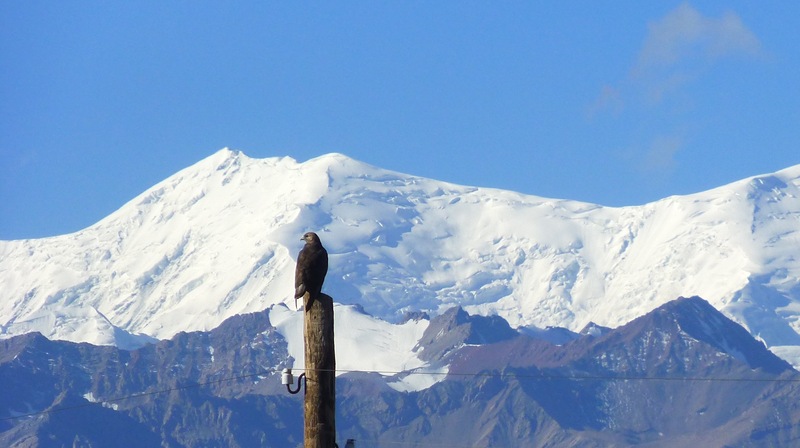 Around us are red mountains, marmots and a few eagles are circling in the air. Other than that there is silence. 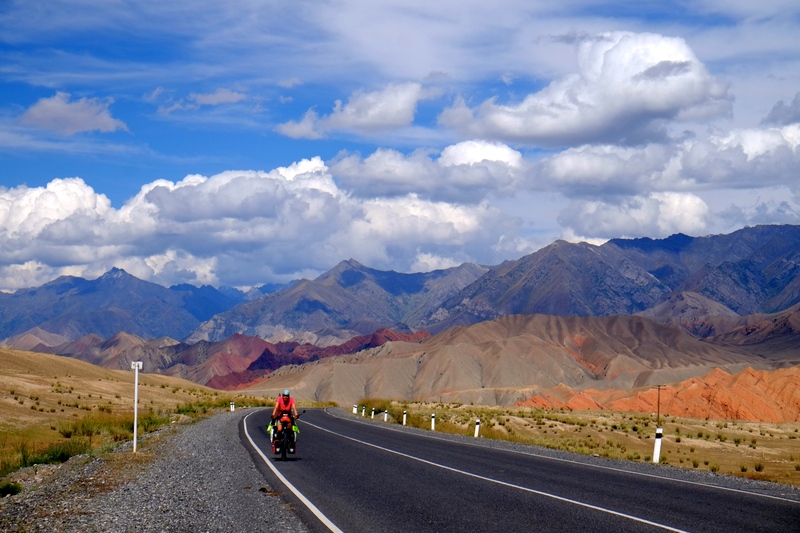 Shortly before the border we meet an Australian motorcyclist warning us that there are issues with customs at the Tajik border. Two French tourists are held by not returning their passports as they don’t want to pay a 10 $ fee for hoax-fumigation. Arriving at the closed border gate a soldier walks slowly towards us asking for cigarettes. As we have none he walks away without opening the gate. 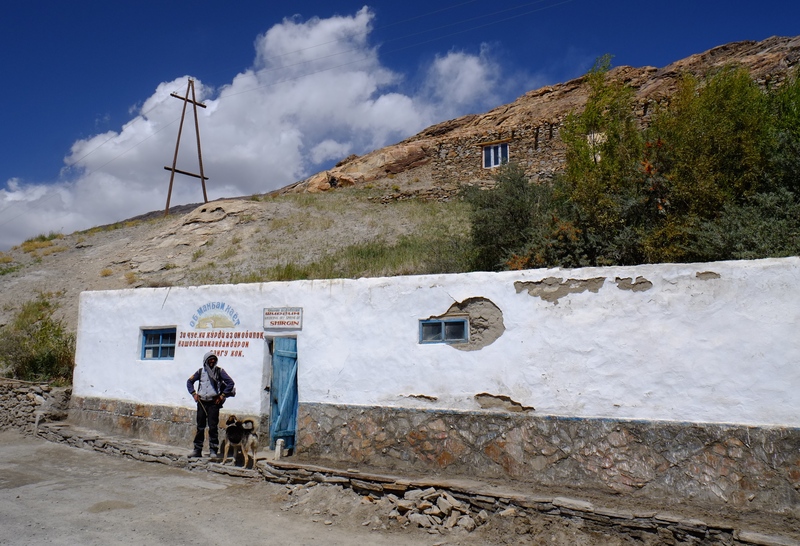 Five minutes later he comes back, opens the gate, guides us to the customs office ( a sea container at an elevation of over 4100m), takes our passports and asks us to wait. 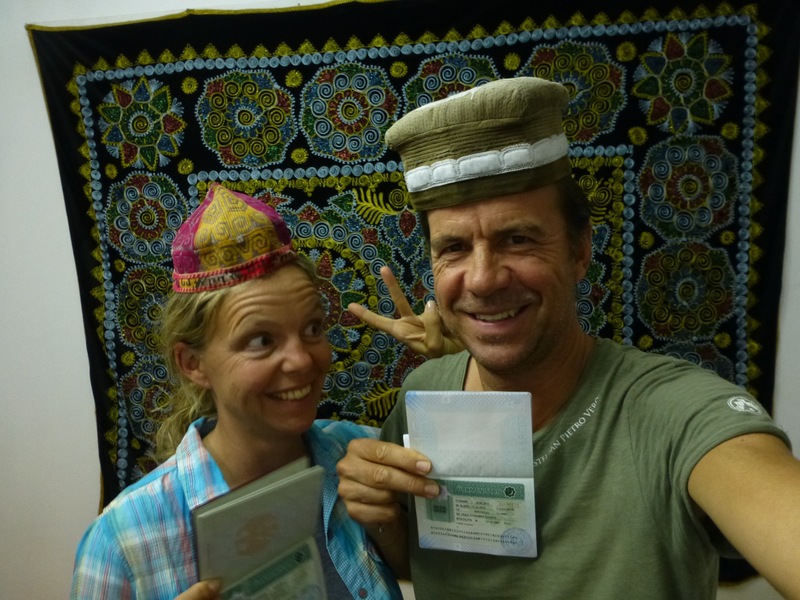 Another five minutes later we get our stamped passports back and are officially welcomed to Tajikistan. We slowly cycle through another gate, always waiting for the fumigation-men, but nothing happens. We’re lucky again. 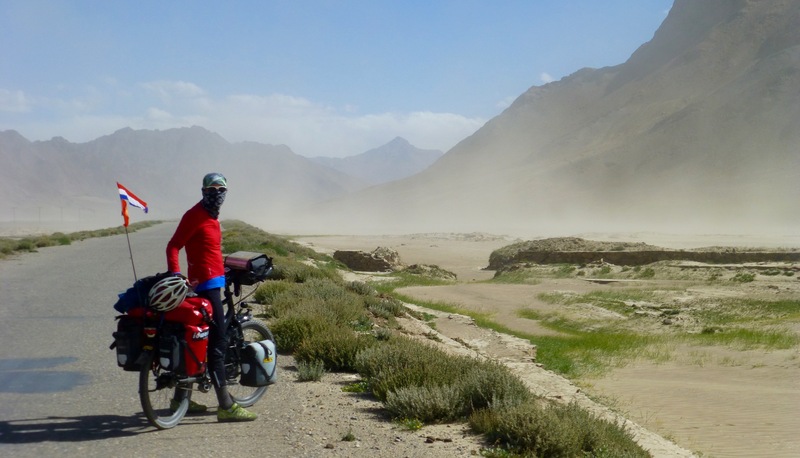 We are now on a short downhill – just before the border we passed our ninth and last pass in Kyrgyzstan at 4336m – and cycle through a moon-like landscape with rough mountains around us, along an almost dried-out riverbed and dust storms that resemble thermal activities. We are even luckier as we are by now flying with a very strong tailwind making it easier for us to tackle today’s pass number two. 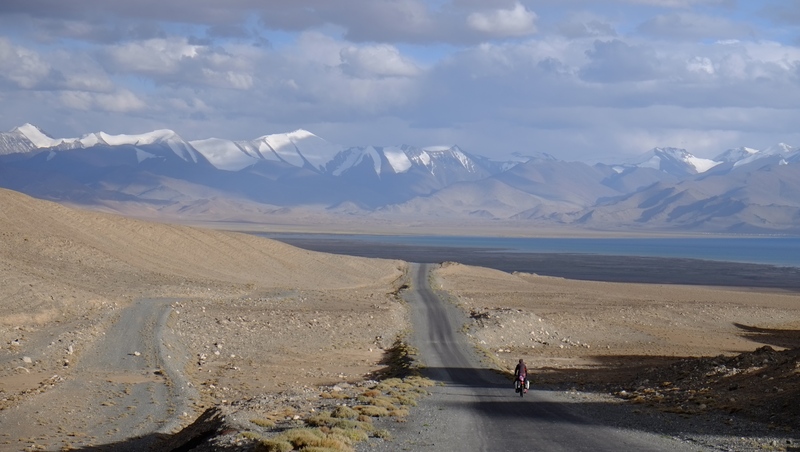 At around 6pm we reach the summit with a fantastic view of lake Karakul. 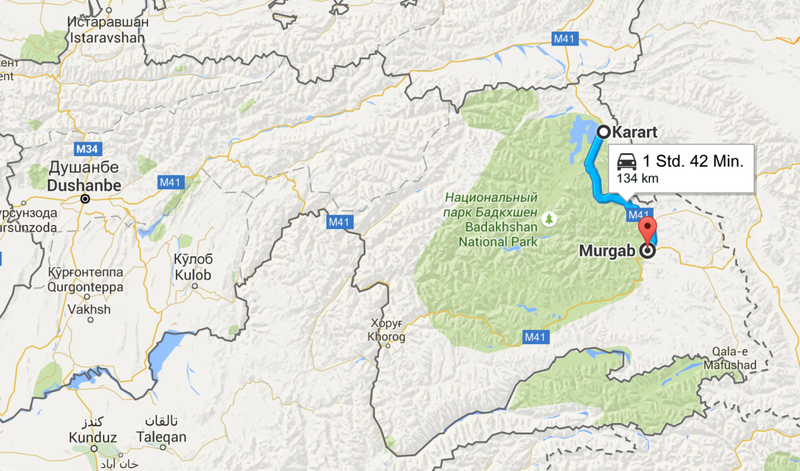 As from now it’s only downhill – 30km! However, the wind decides to change and the last 10km are a fight against it. Right before dark we arrive. 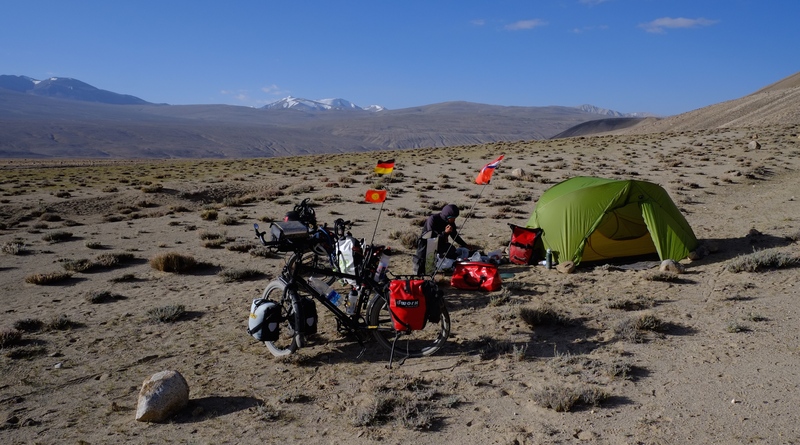 Shattered but happy about our achievement – especially as we learned the next day, that we overtook a Scottish couple on their lightweight bikes! 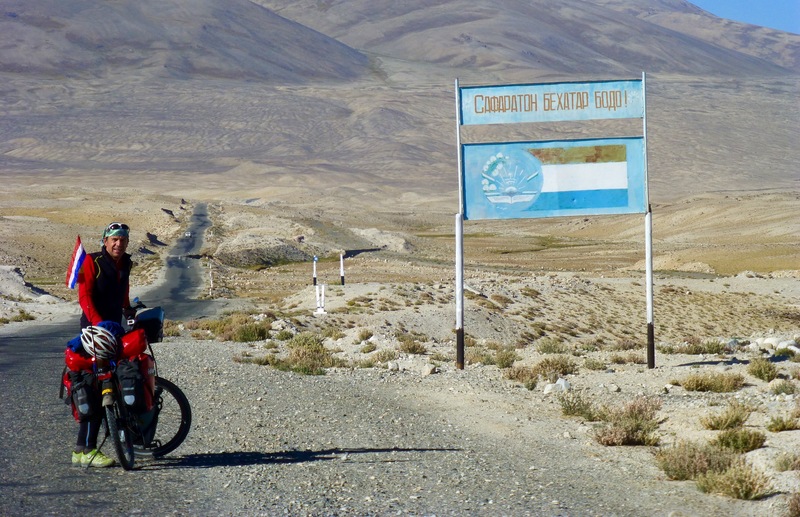 If an old R4 can do the Pamir Highway we should be able to do so, too!